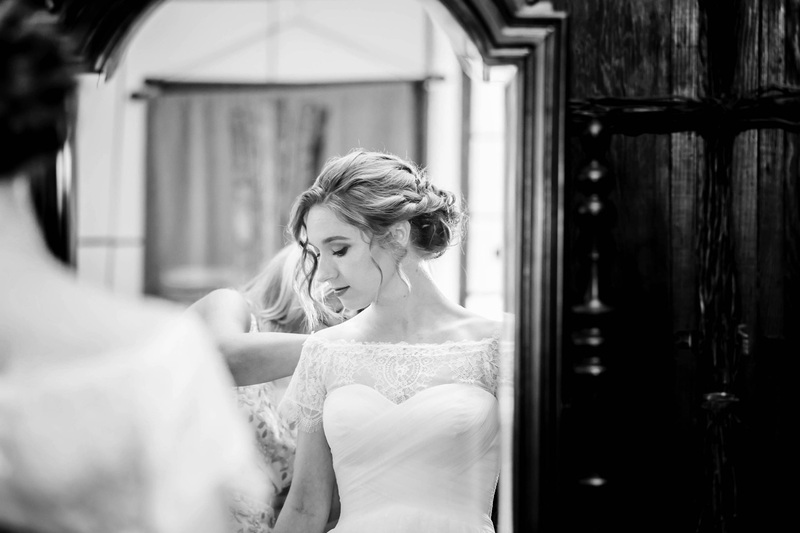 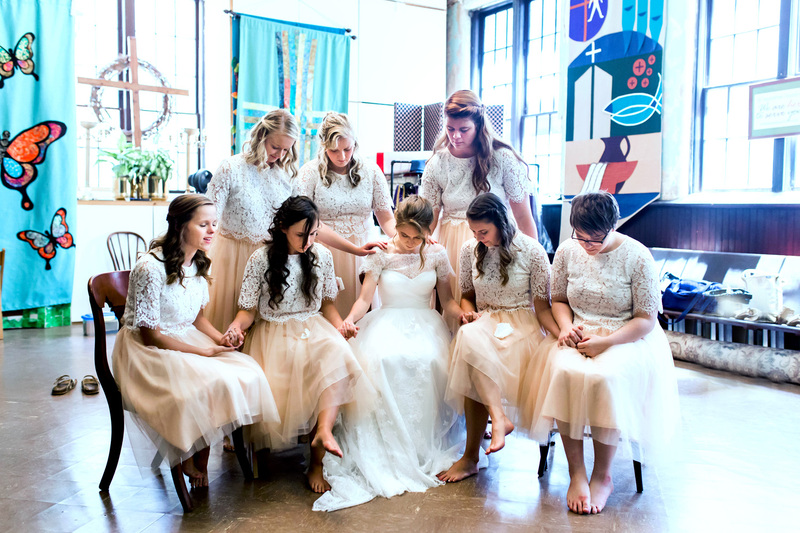 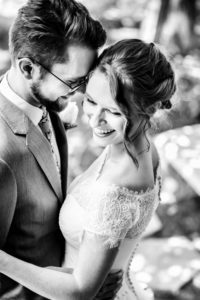 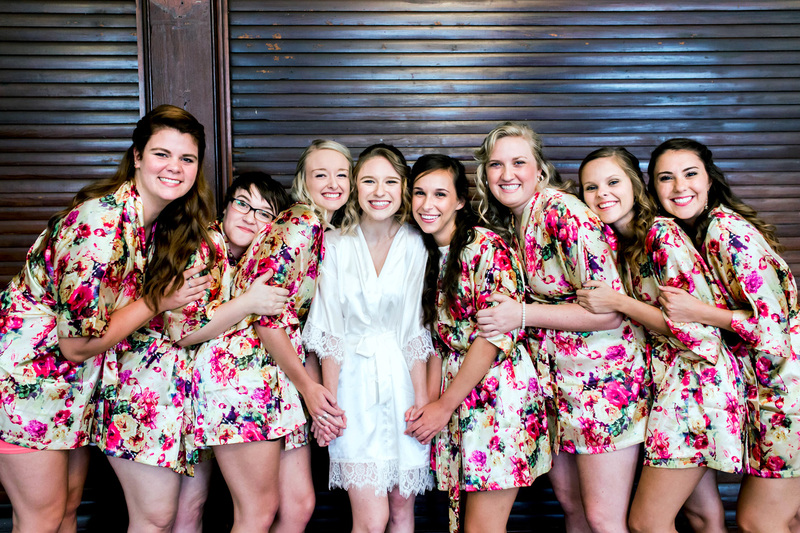 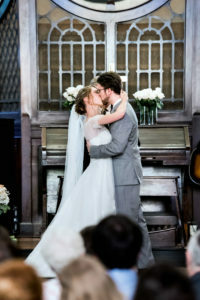 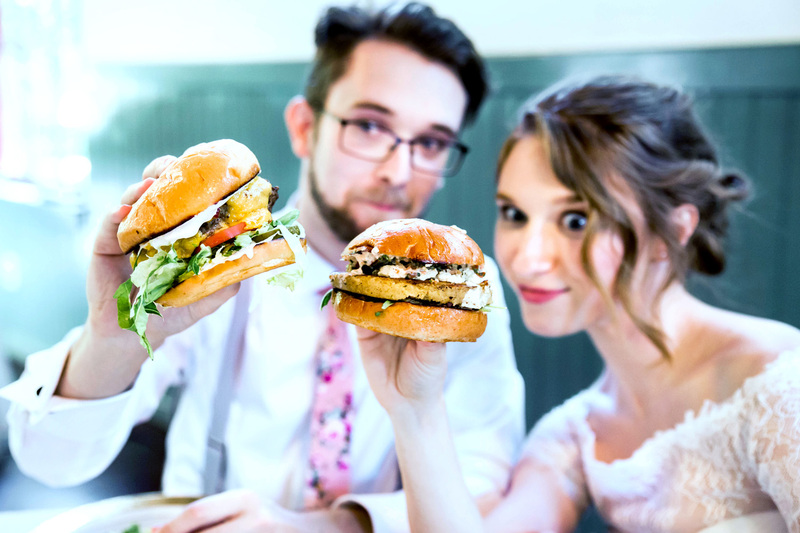 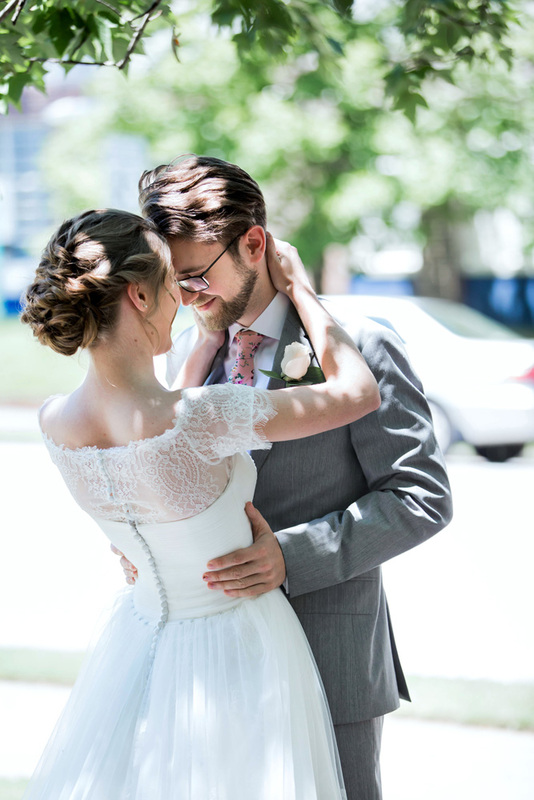 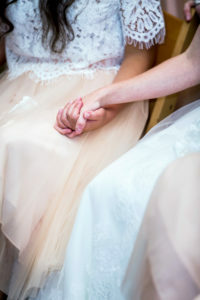 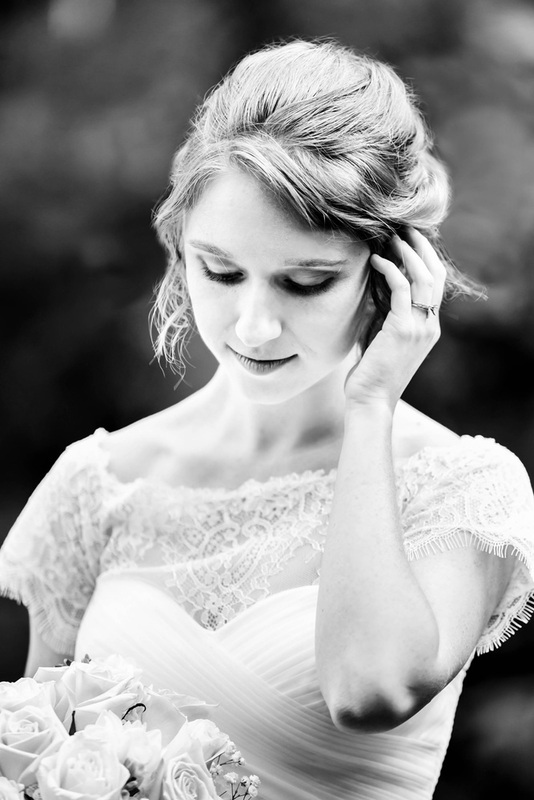 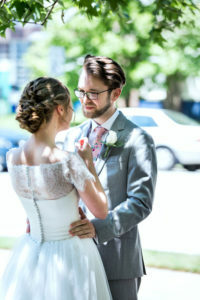 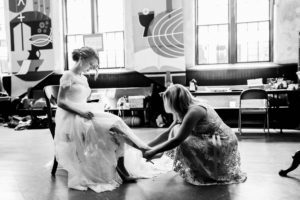 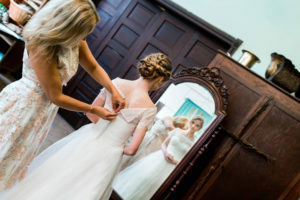 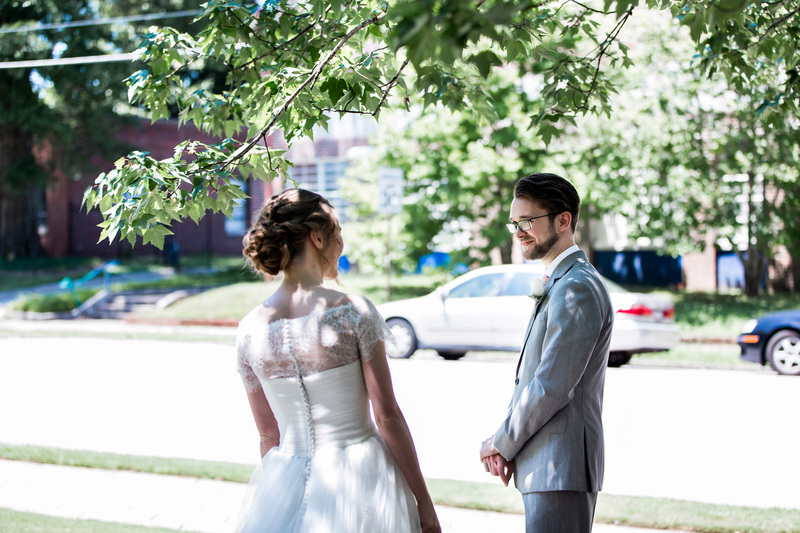 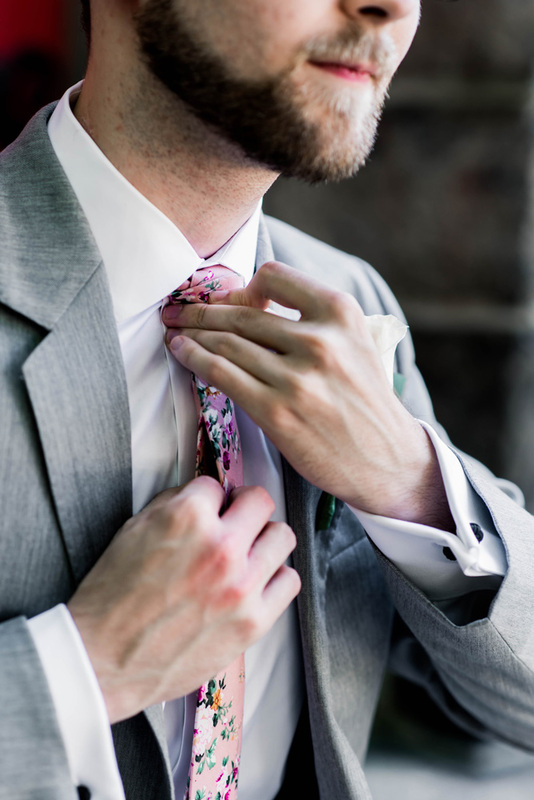 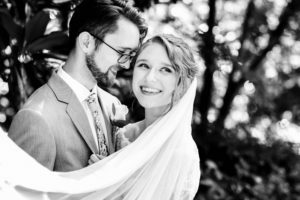 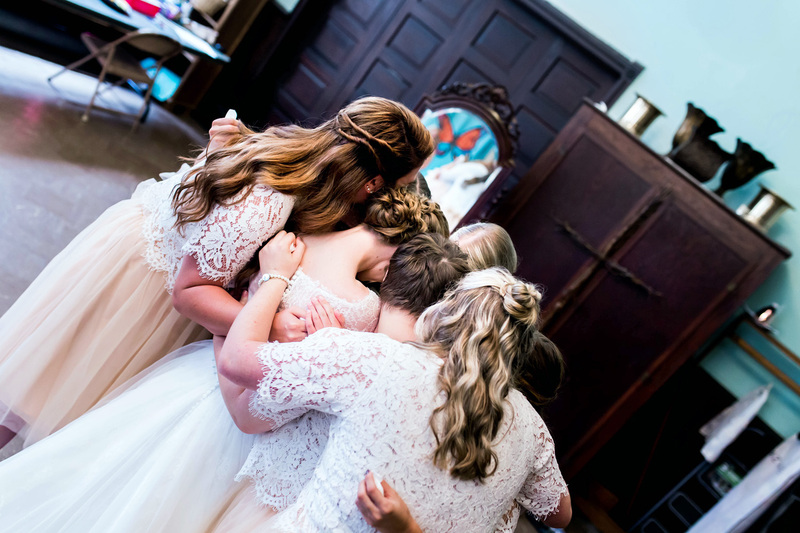 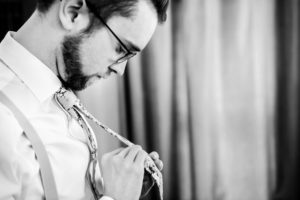 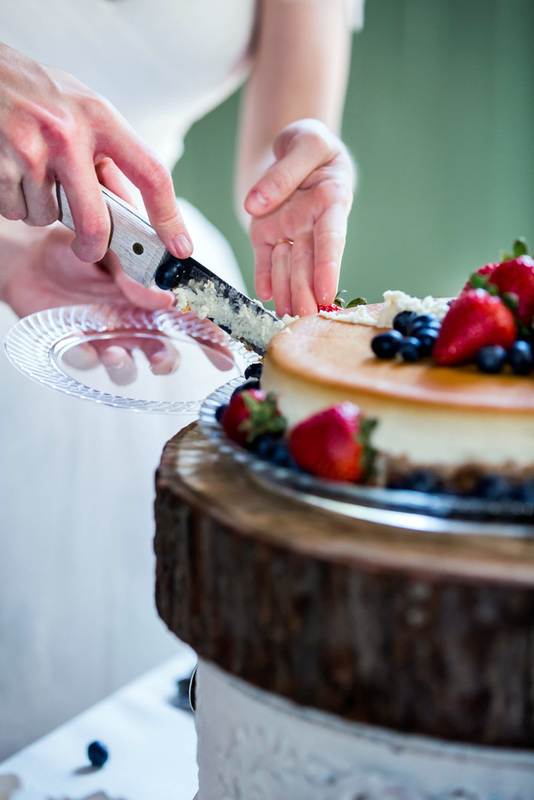 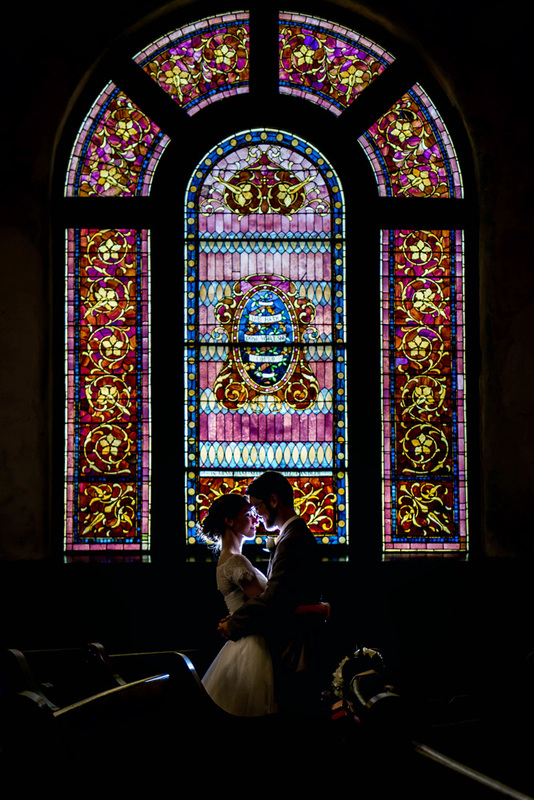 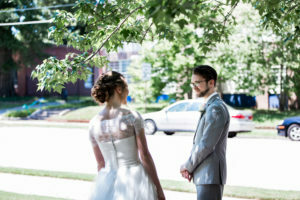 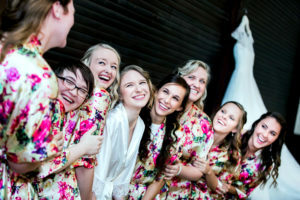 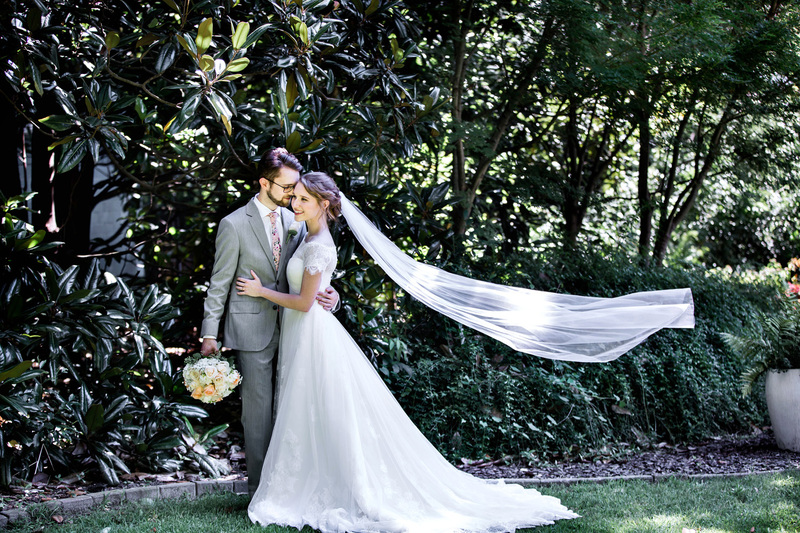 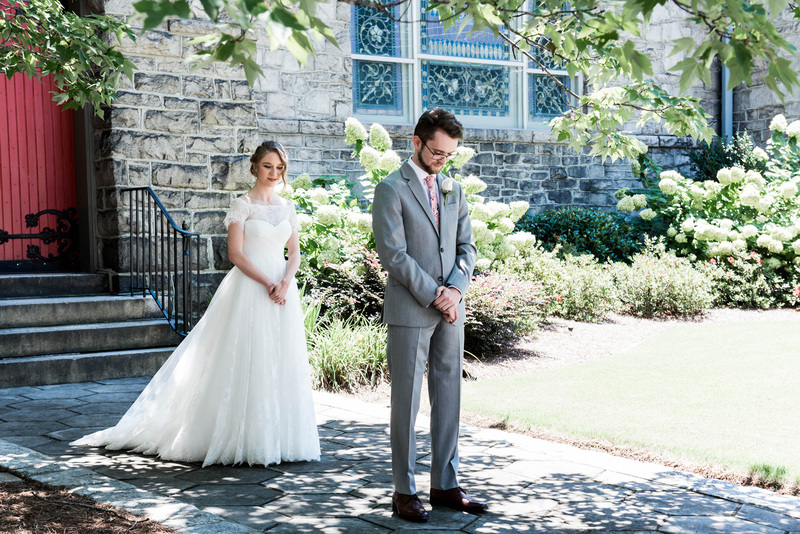 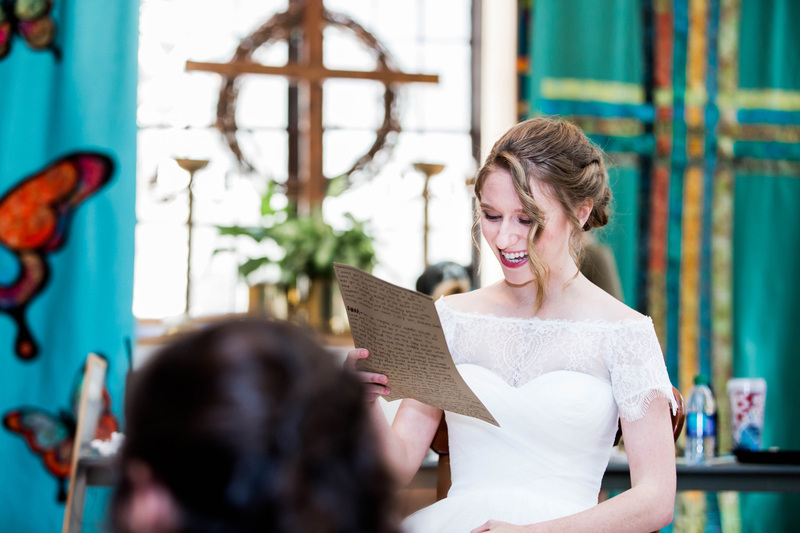 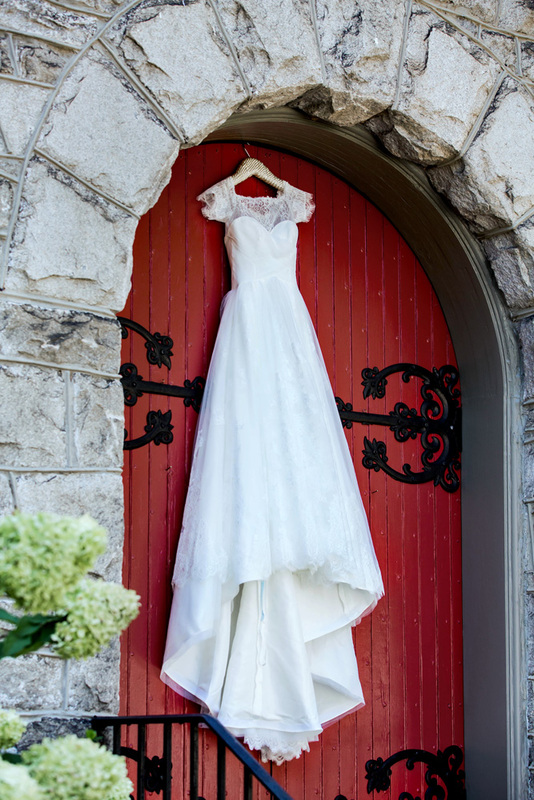 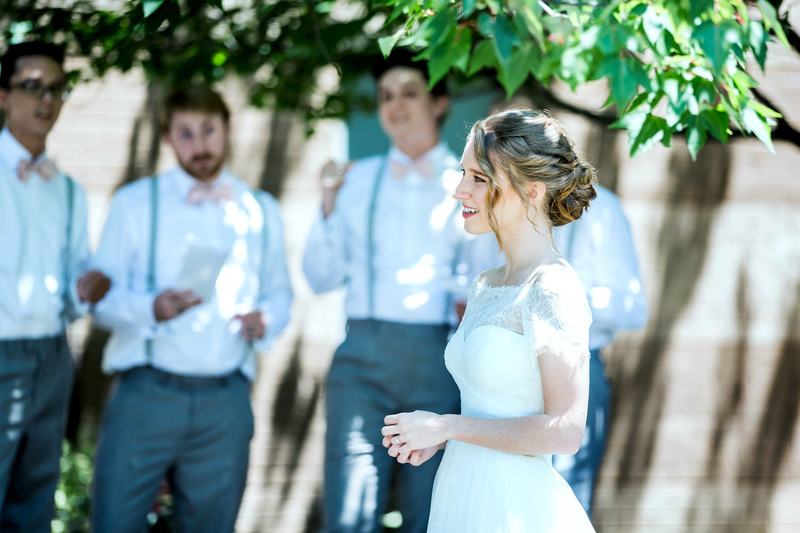 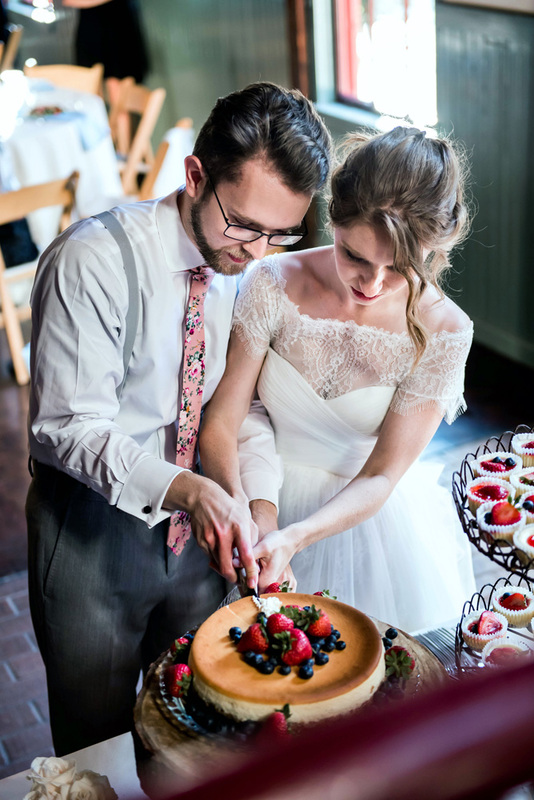 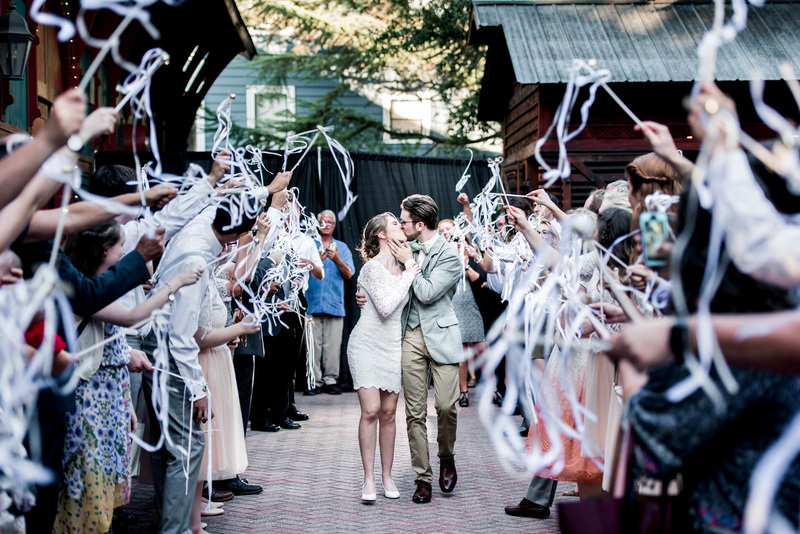 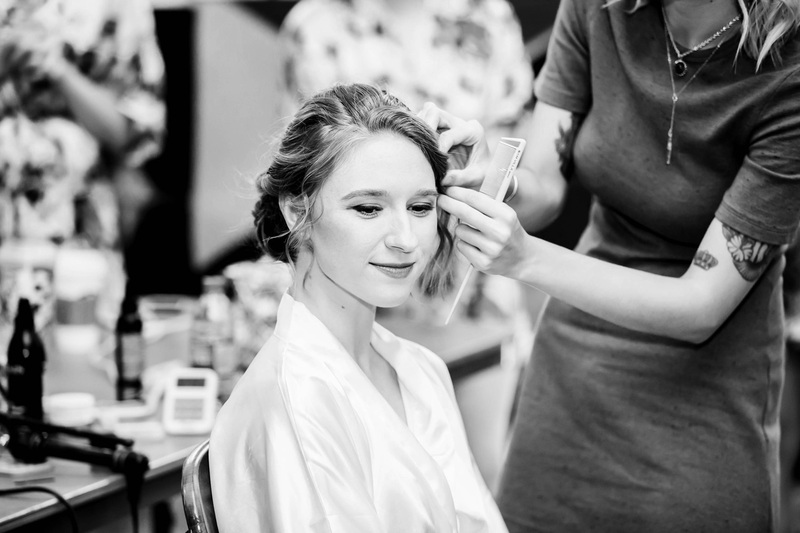 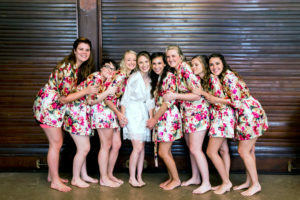 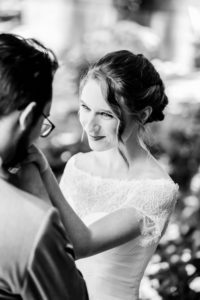 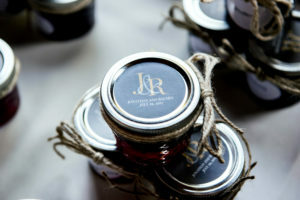 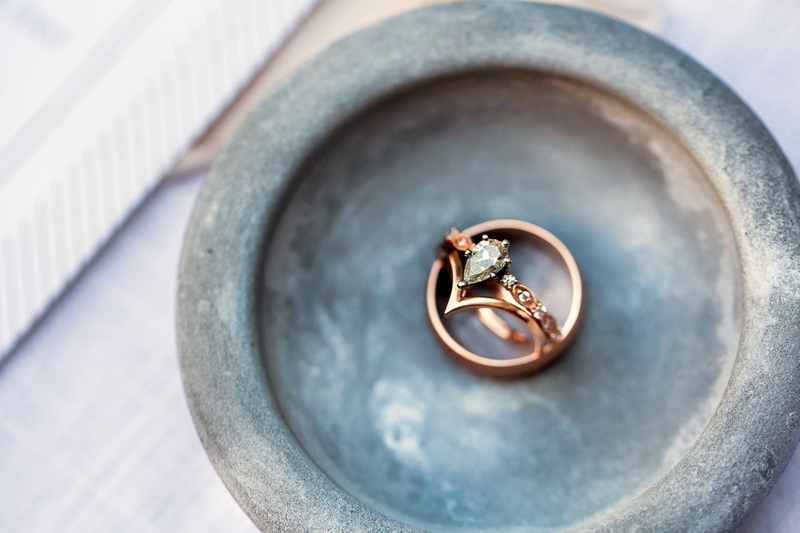 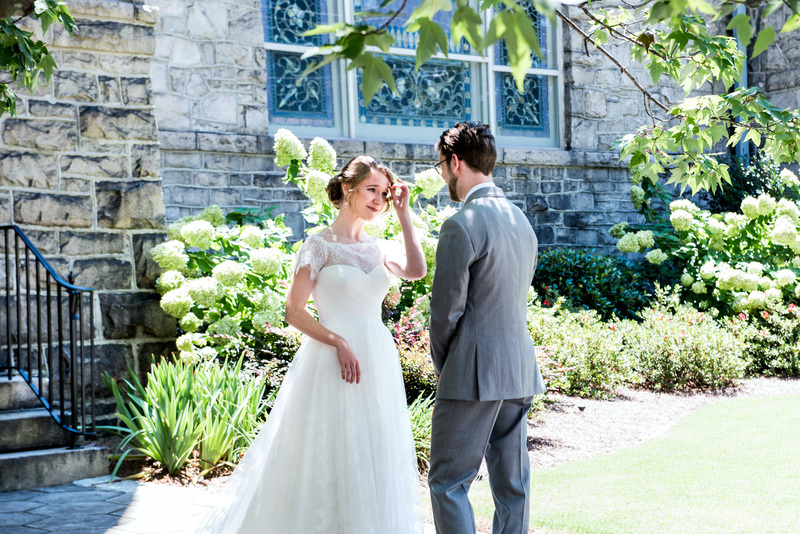 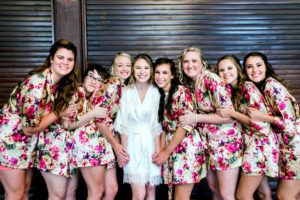 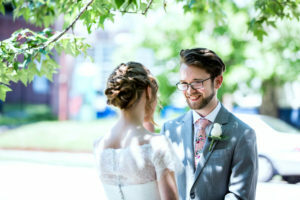 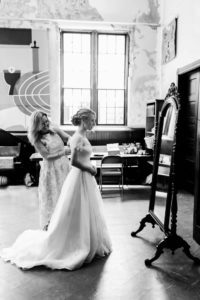 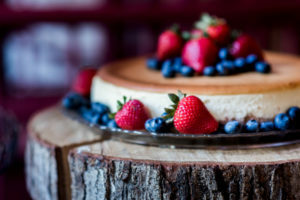 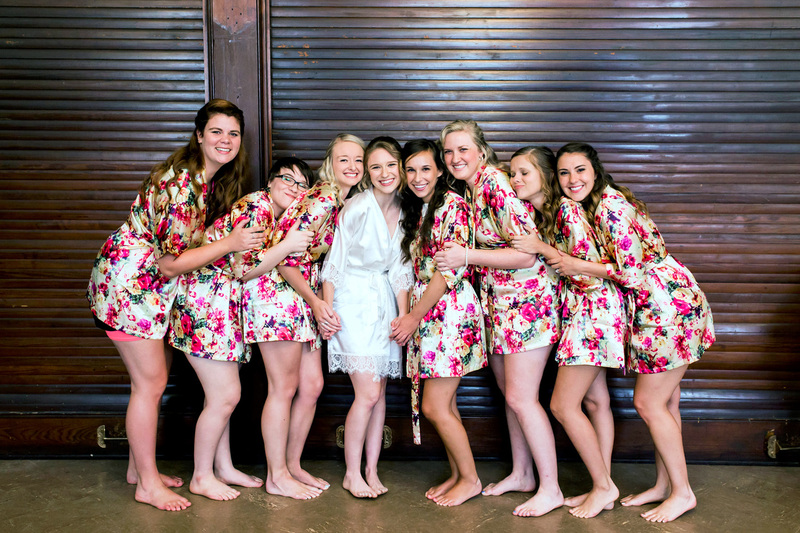 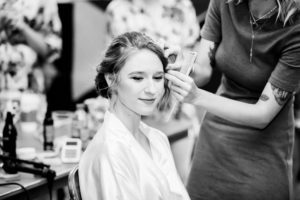 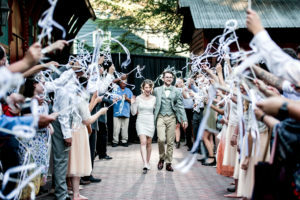 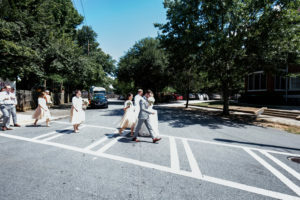 Tse Photography | Rachel & Jonathan’s Unique GA Wedding combining Two of Atlanta’s FavoriteVenues! 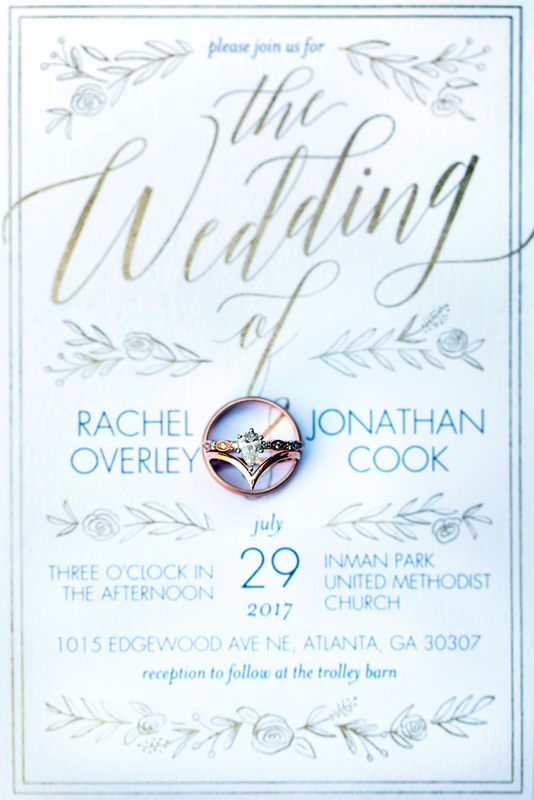 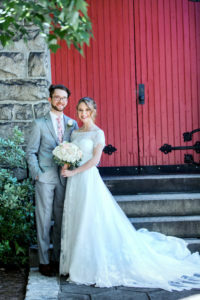 Rachel & Jonathan’s Unique GA Wedding combining Two of Atlanta’s FavoriteVenues! 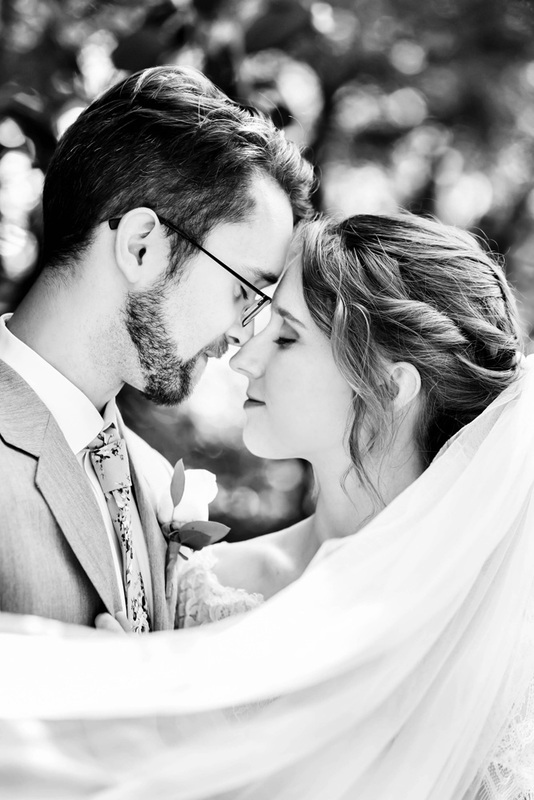 Rachel and Jonathan first met in high school and then dated all through college. 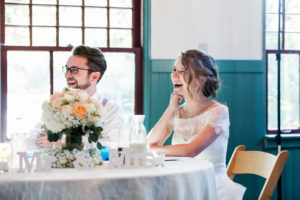 So “high school sweethearts” can be an accurate statement – even if he stalked her before she knew him. However, luckily for math class she did at last meet the stalker who would soon become her forever husband. 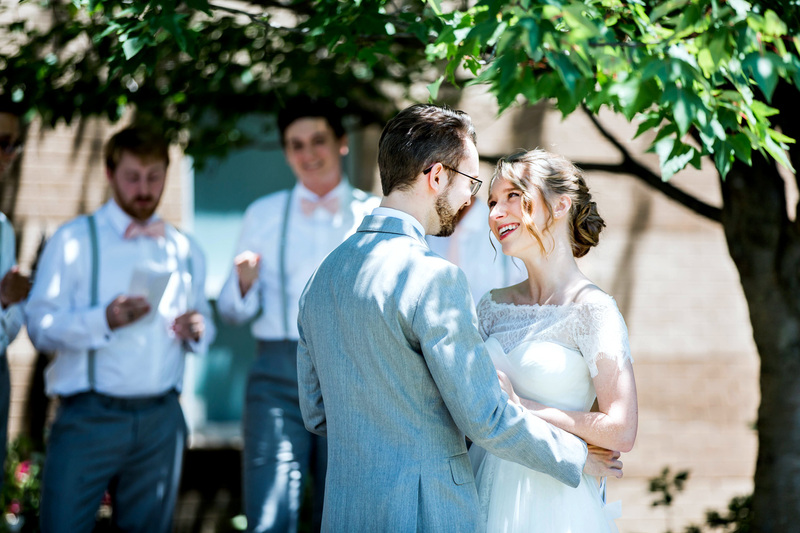 Rachel is so grateful for dating Jonathan that long and taking on the challenge of long distance during their college years. It grew them so much and made saying “yes” to him an easy answer. Rachel had been with Jonathan for four years at the point of their engagement and he still surprised her when he asked the question. 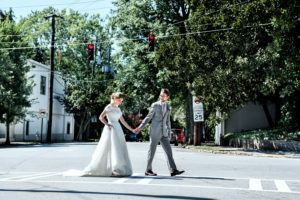 The engagement was incredibly unexpected and included a series of events that led her to be chauffeured to Rutledge Georgia and walk down to a creek where a nicely dressed Jonathan was. 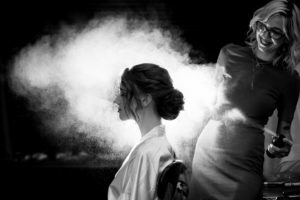 Throughout the journey he would put in little hints based on special moments they had in the past and she knew what was coming. 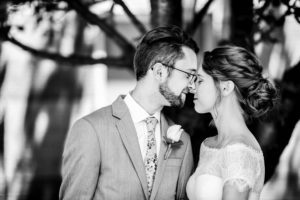 They have been through many trials, but getting through them made preparing for marriage so much easier. 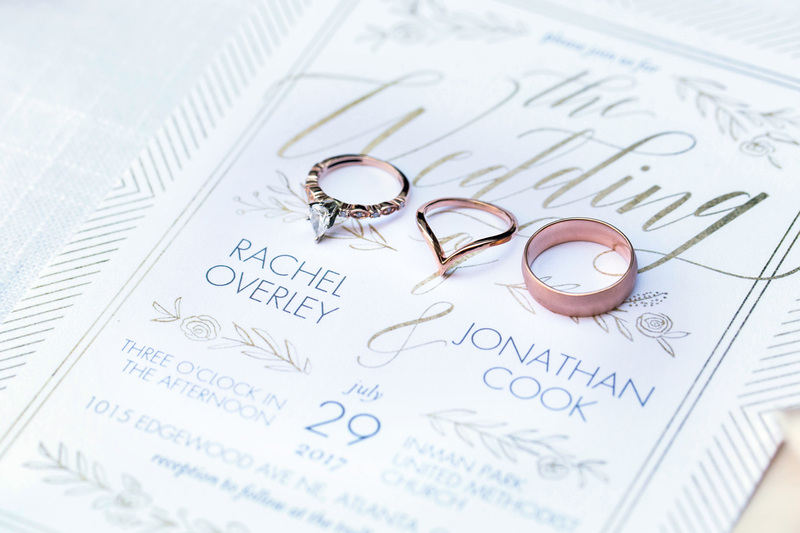 It’s a joy for Rachel to marry him and she can’t imagine life without her best friend. He always makes her life feel like a dream! 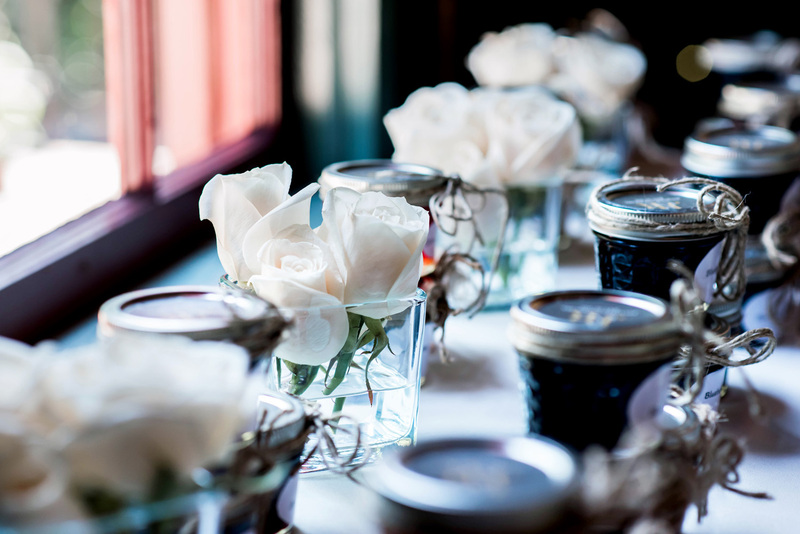 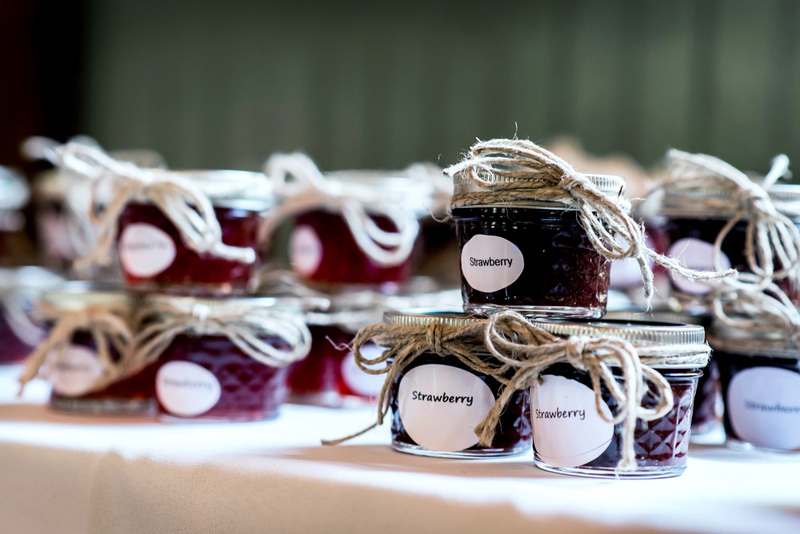 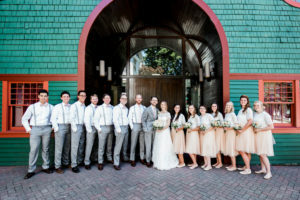 • For the theme of the wedding, they went with was something like “summer rustic chic”. 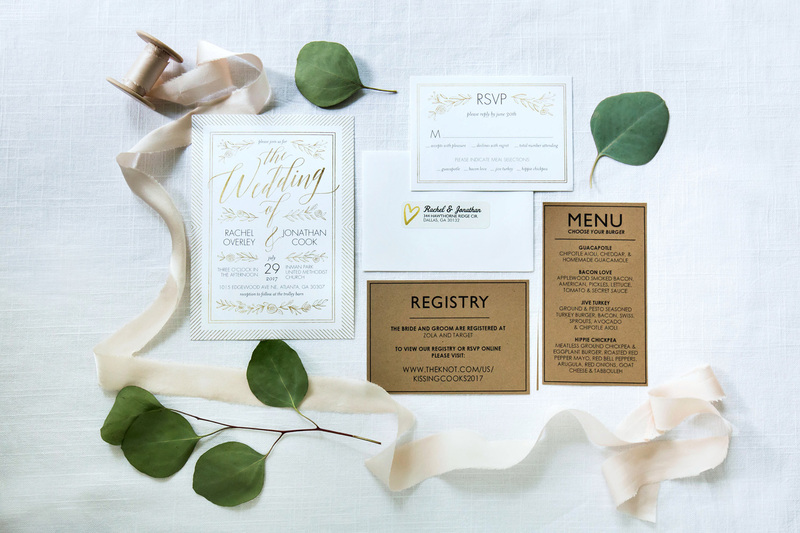 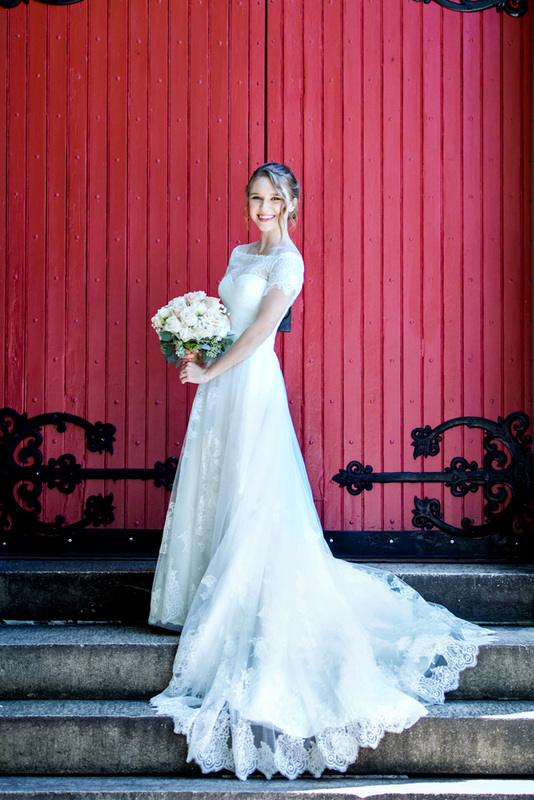 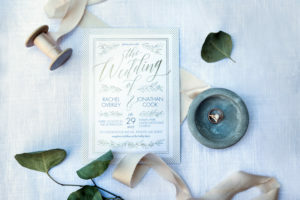 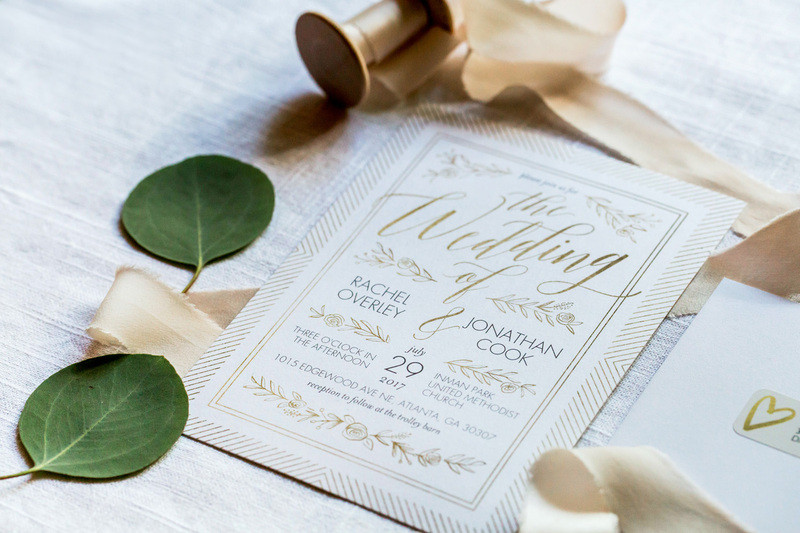 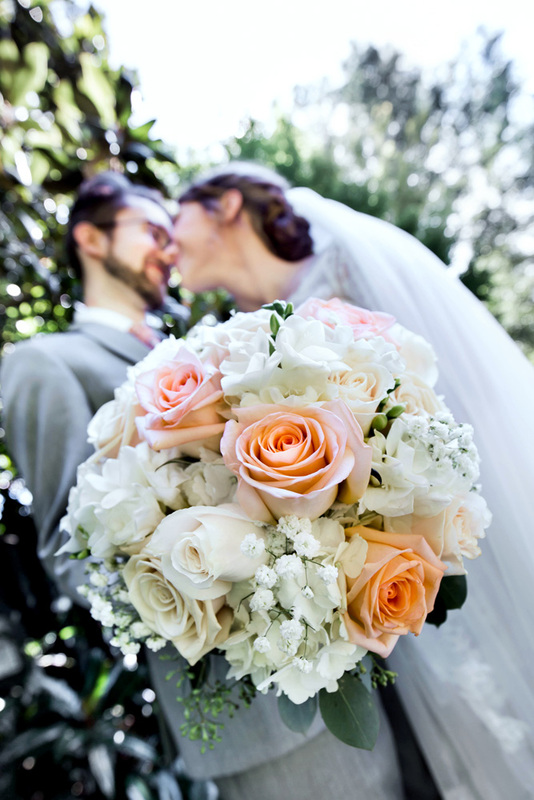 Rachel really likes elegant soft colors and felt that these paired well with neutral warm tones. They wanted it to be summery and homey at that same time. 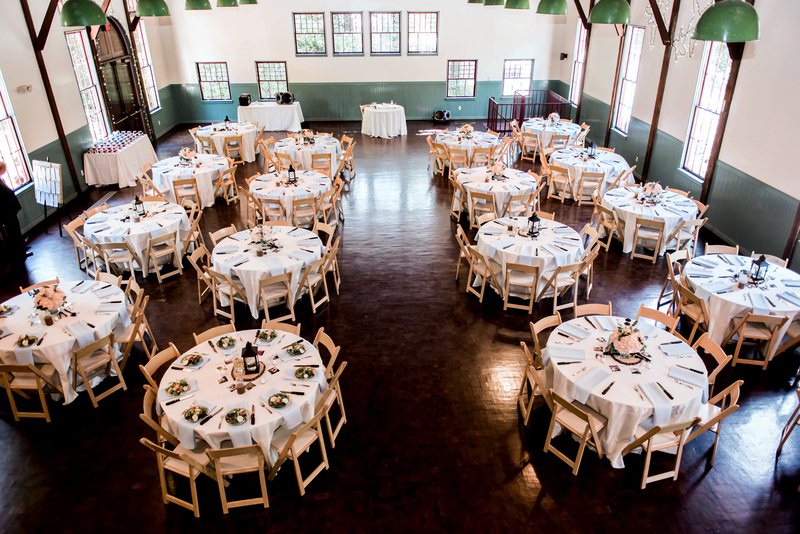 • The VENUE!! 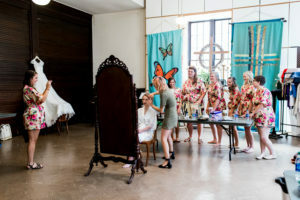 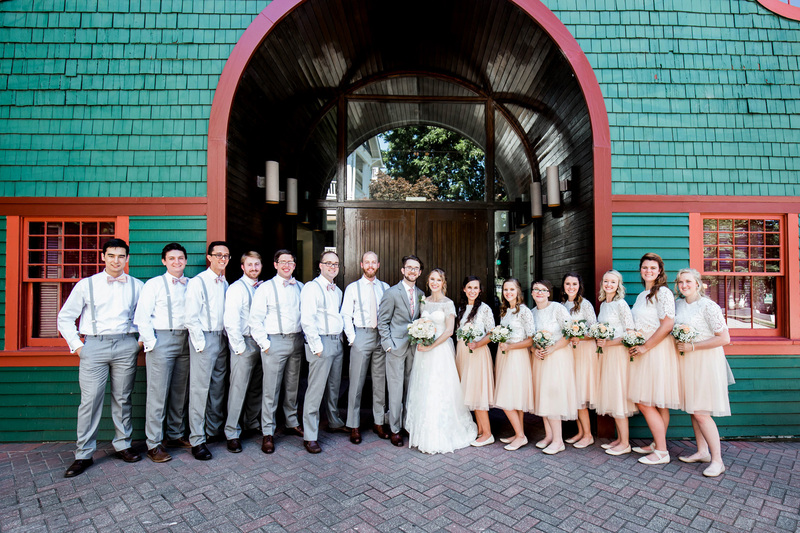 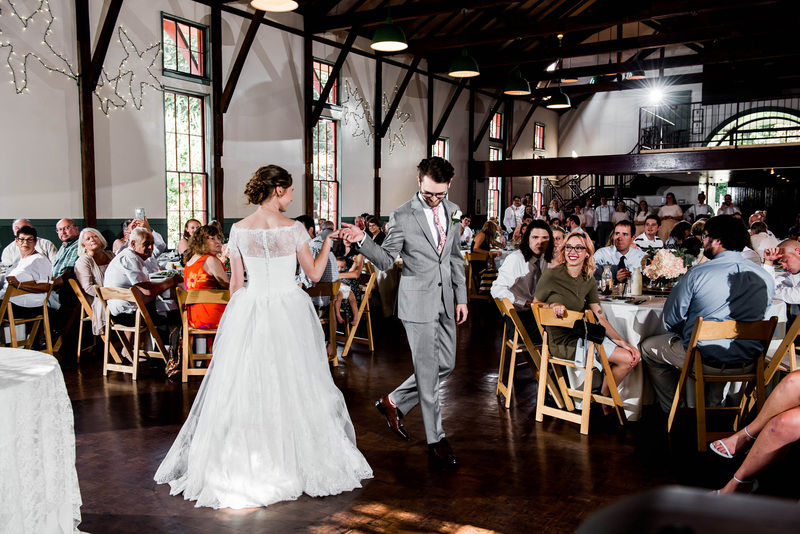 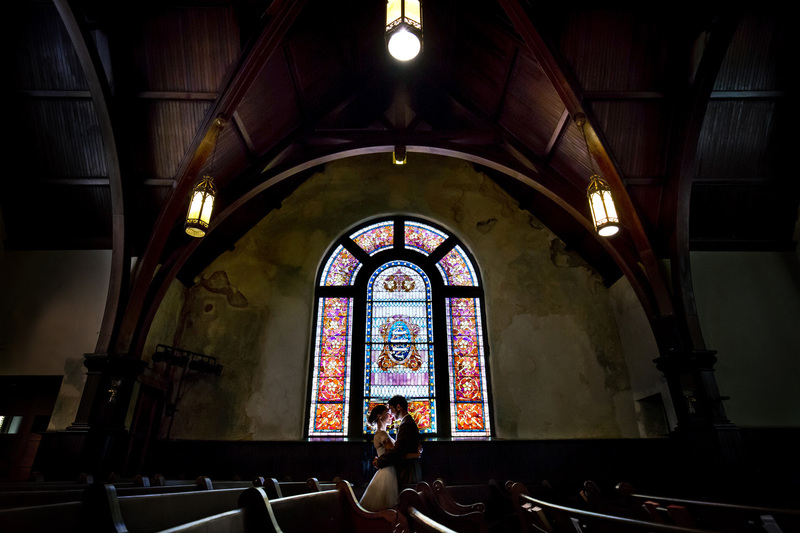 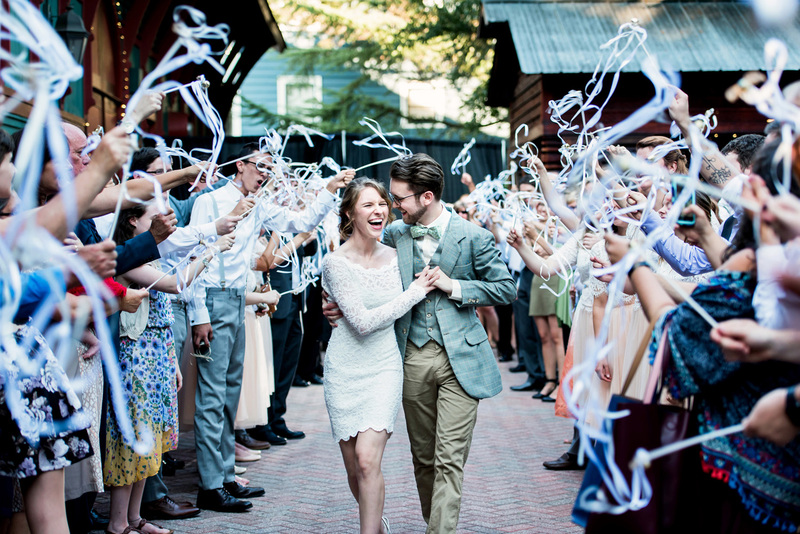 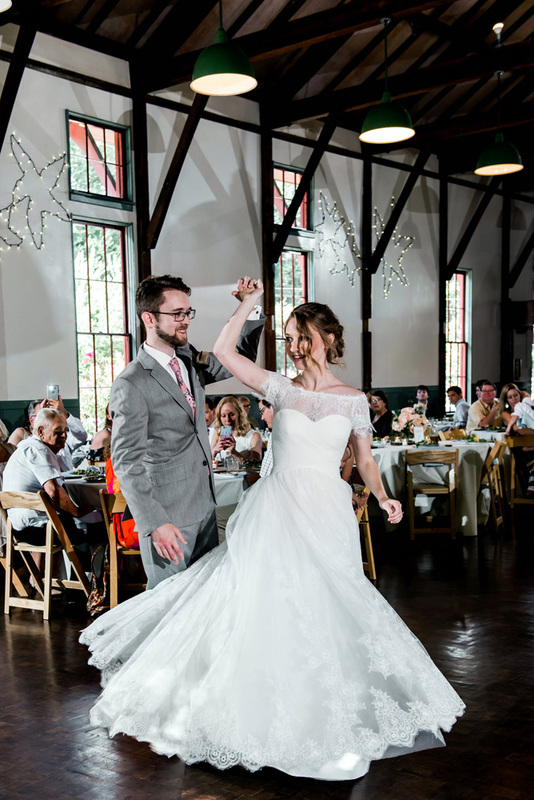 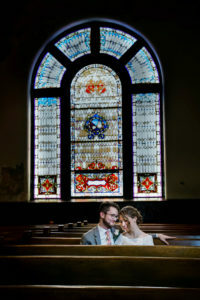 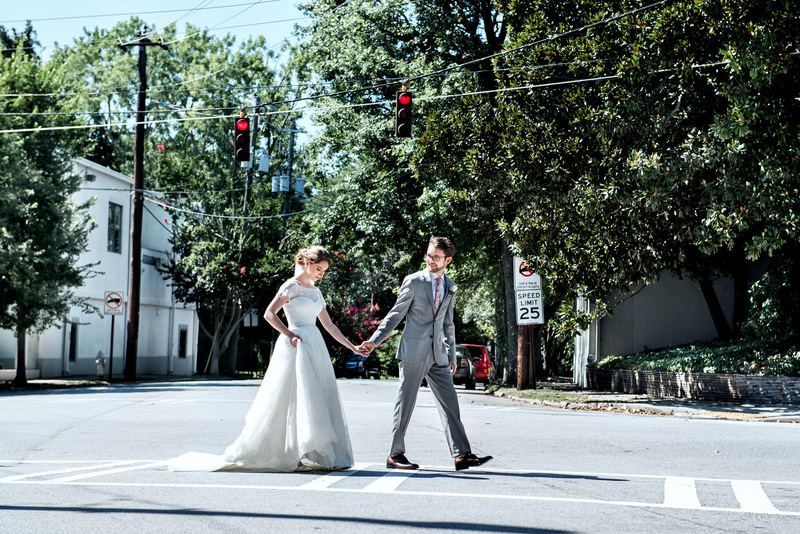 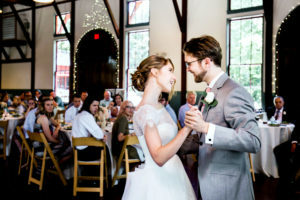 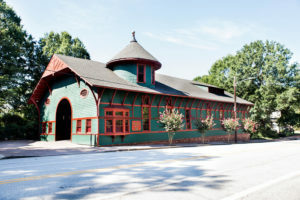 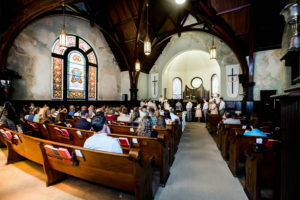 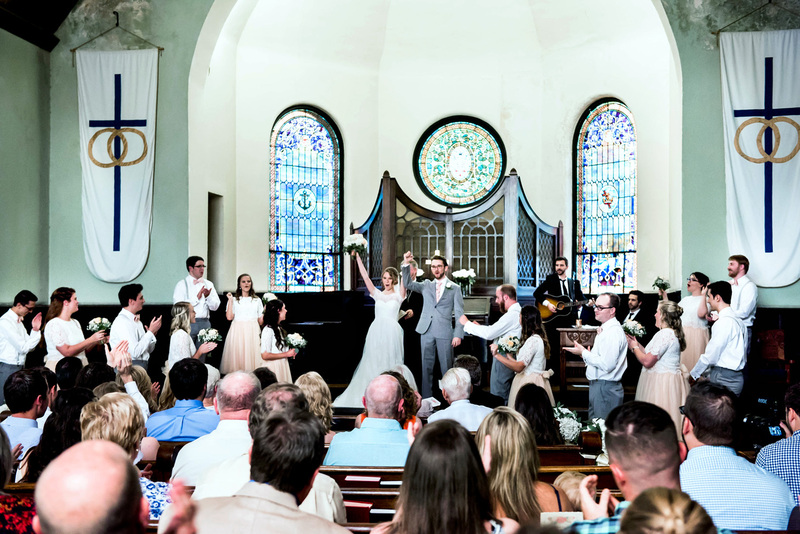 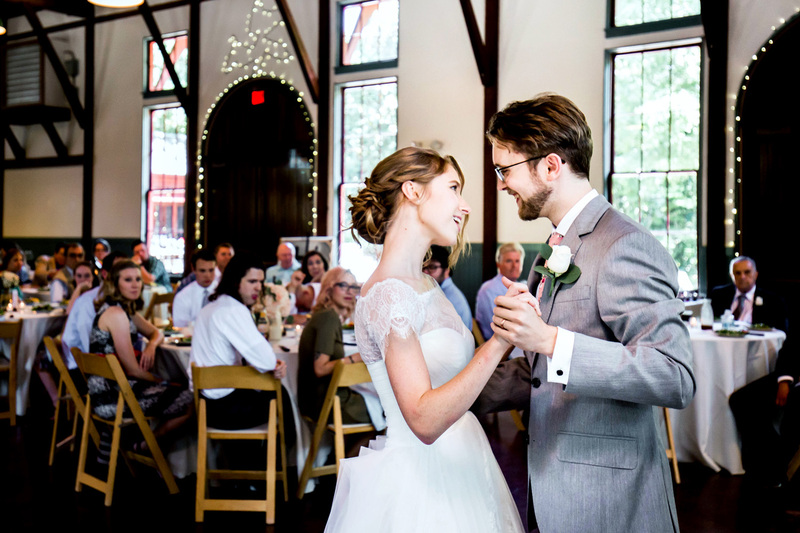 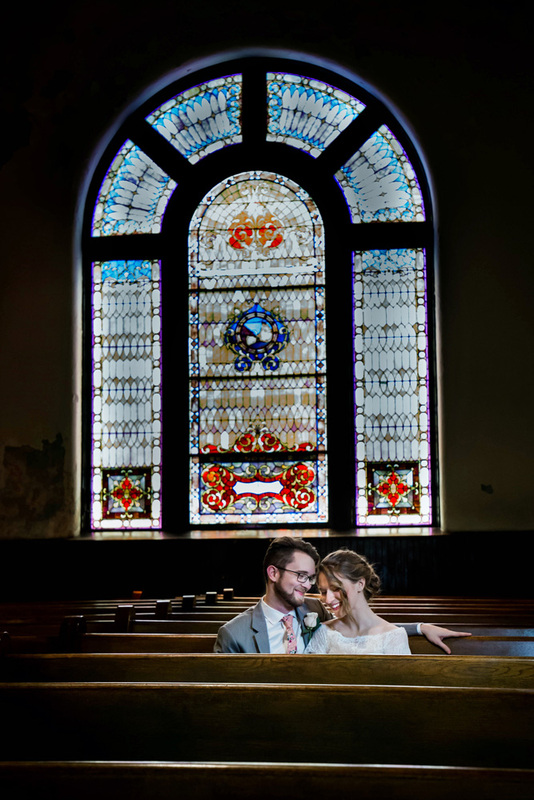 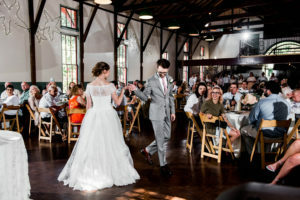 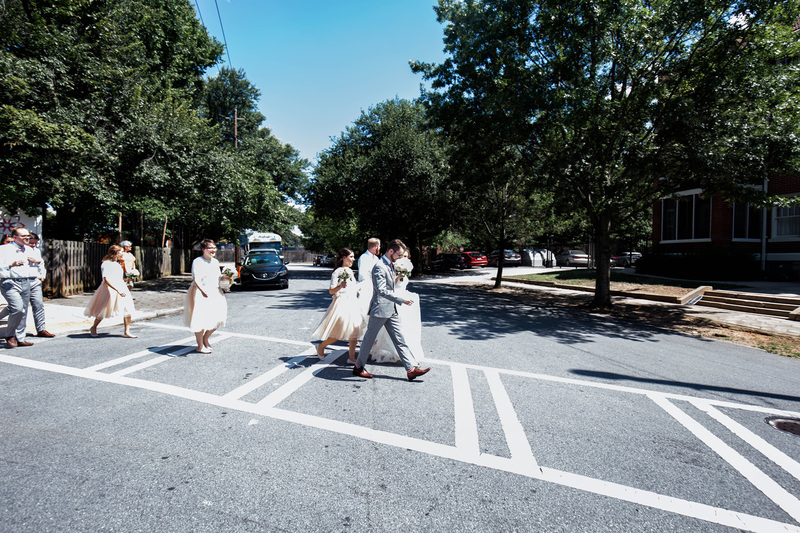 — They picked Inman Park UMC and the Trolley Barn based on their great Atlanta location and proximity to each other, as well as much of their overall look. 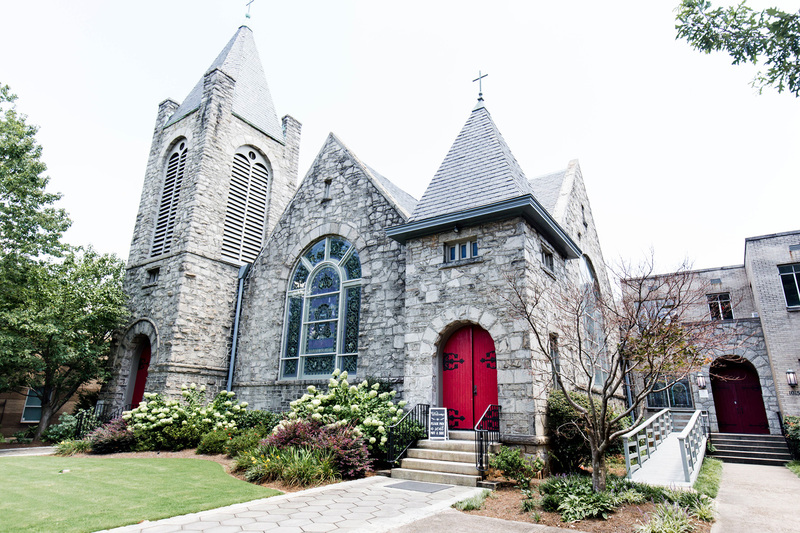 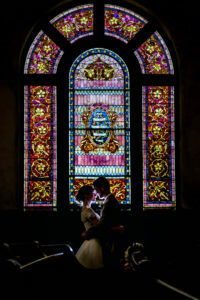 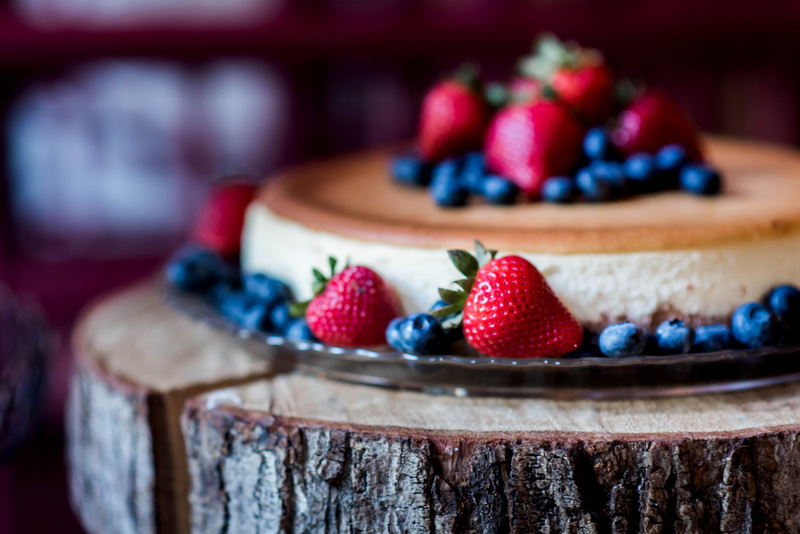 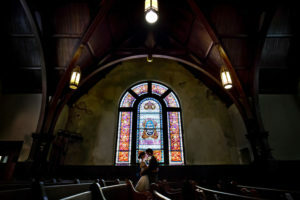 Not to mention that they are Atlanta’s Favorite and most Sought-After Venues! 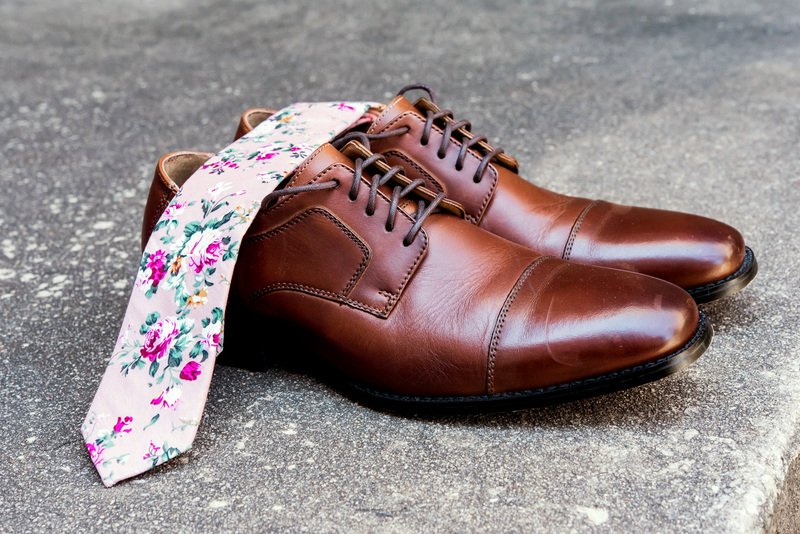 They were both uniquely rustic and elegant at the same time. 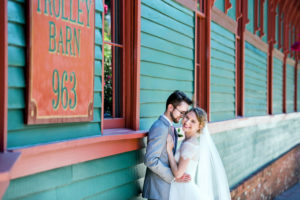 They visited the Trolley Barn first and fell in love with its history and aesthetic aspects (outdoor patio, bar house, garden, vibrant colors). 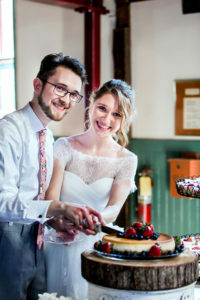 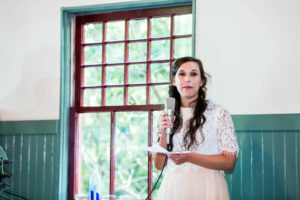 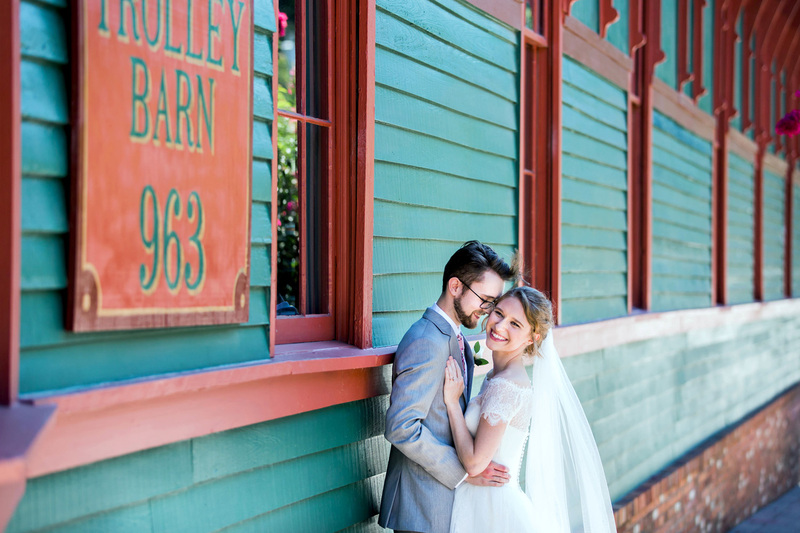 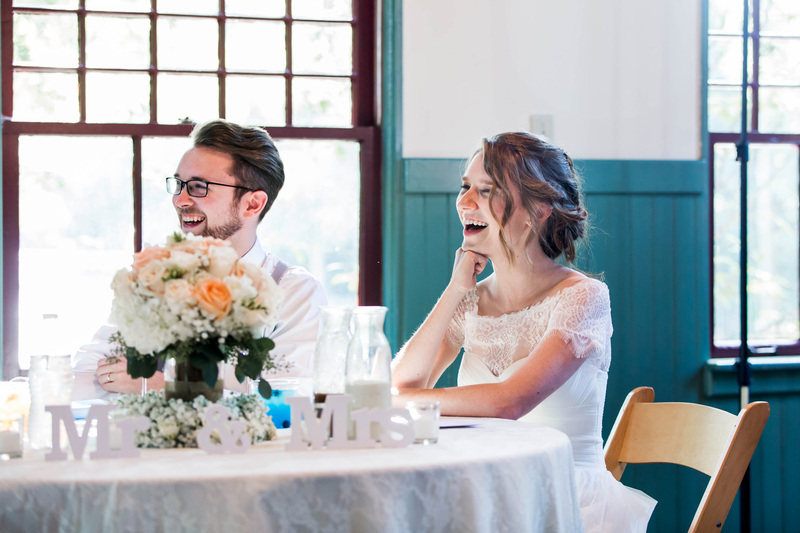 Rachel knew she wanted to get married in a church and after they saw the Trolley Barn, they drove by the church (super close!) 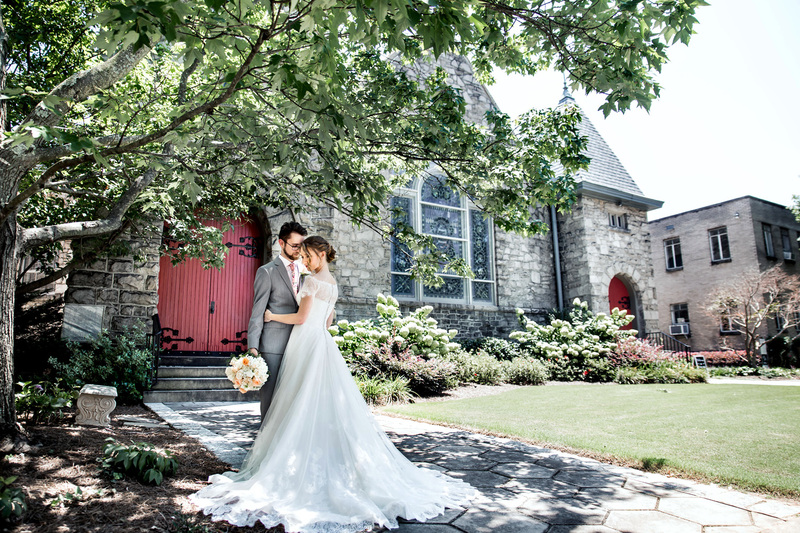 and they fell in love with the grey stone and big red door. 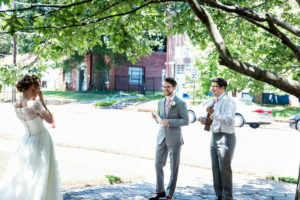 It was exactly what they envisioned! 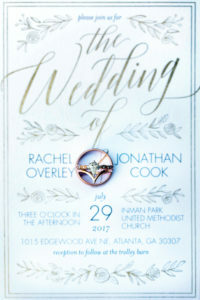 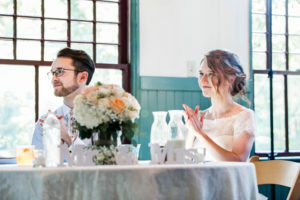 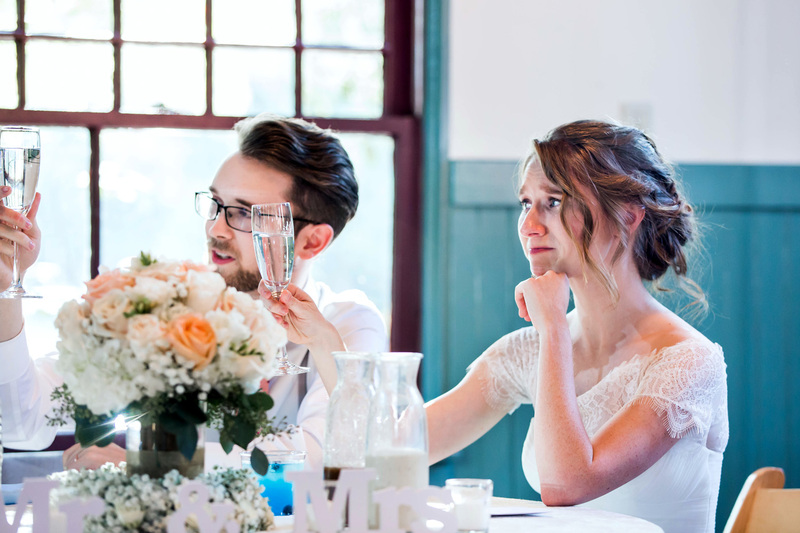 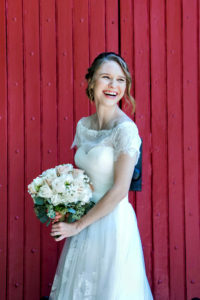 • The Wedding –Rachel and Jonathan decided to do a first look, but what Rachel didn’t know was Jonathan prepared a surprise! 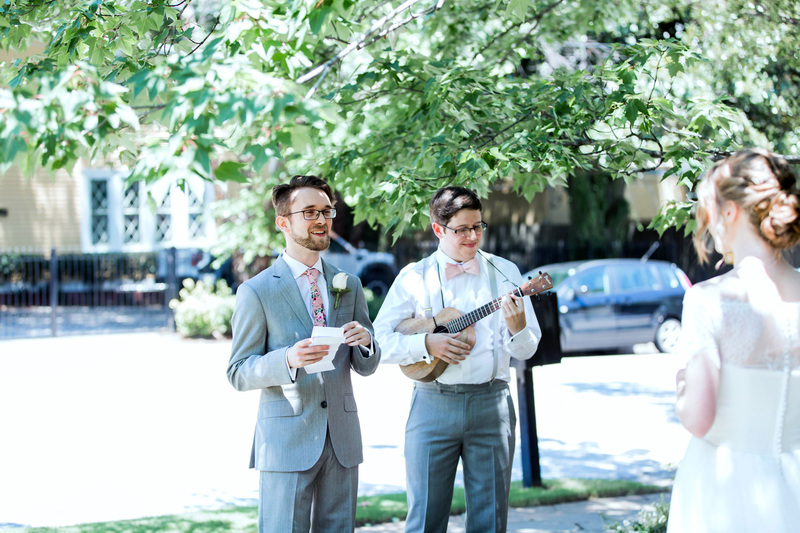 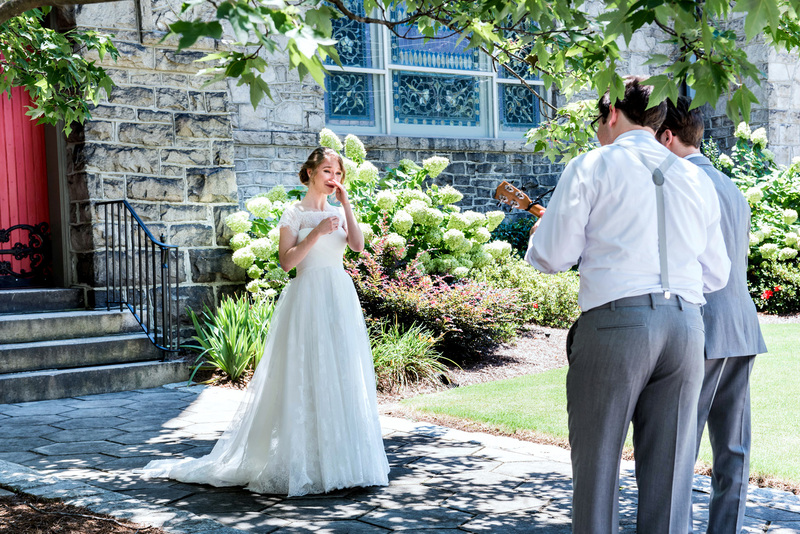 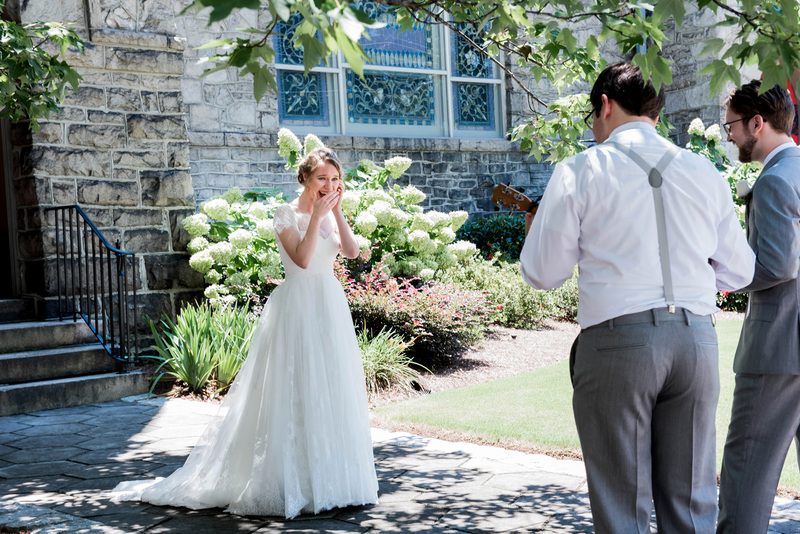 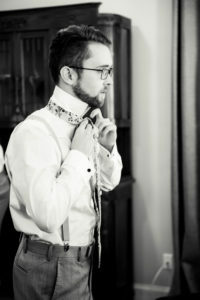 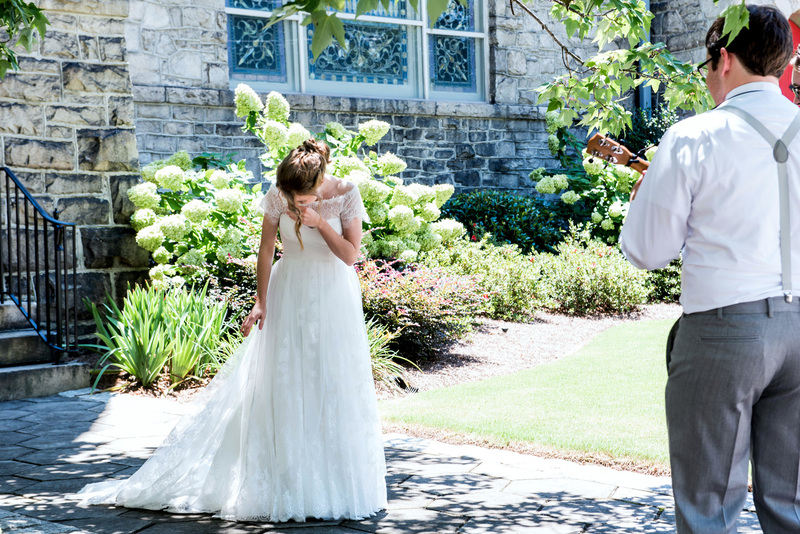 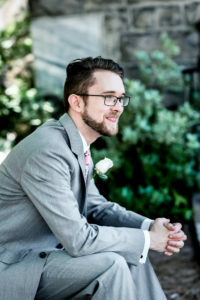 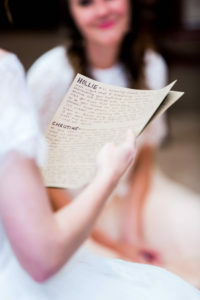 Right after the first look, one of the groomsmen came out with a ukulele and Jonathan began to sing! 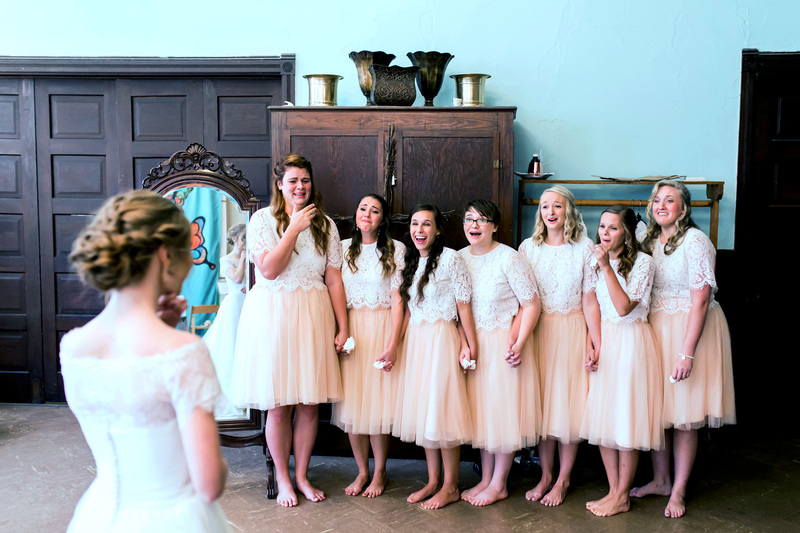 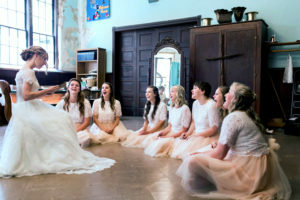 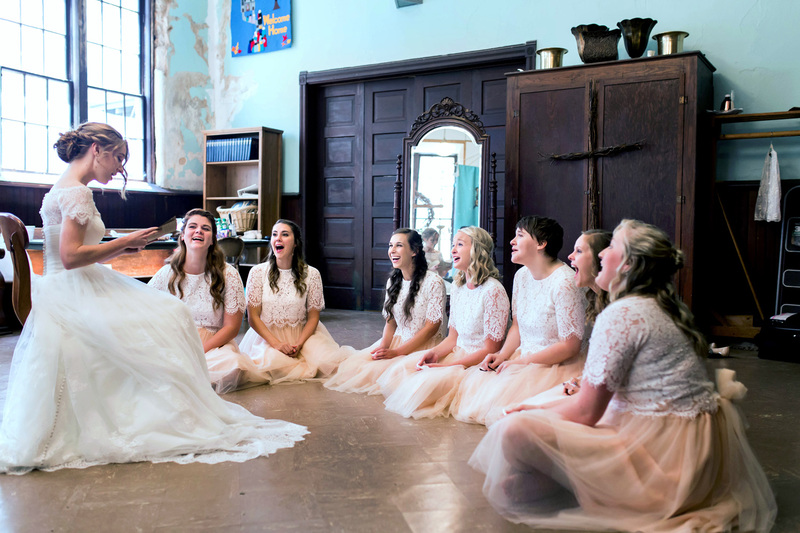 While Rachel was in tears and laughing at the same time, when come time for chorus, all of the groomsmen came out and sing along! 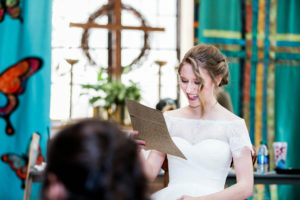 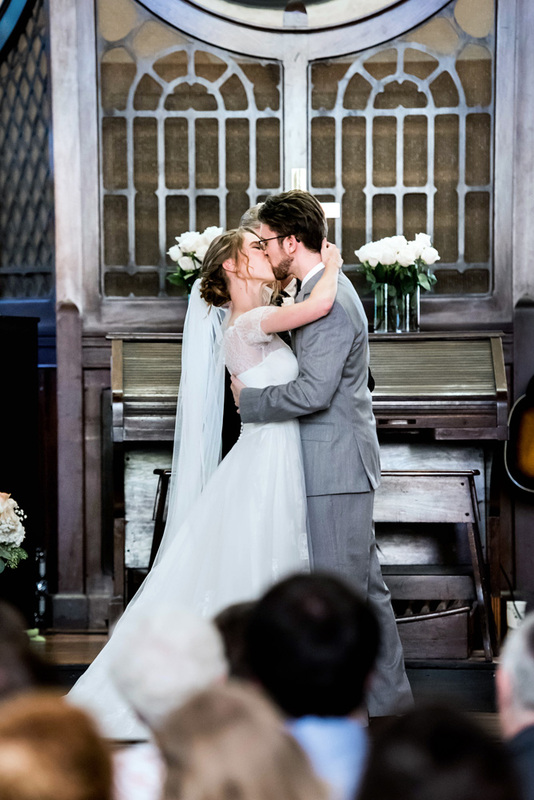 It was truly the best first look moment ever! 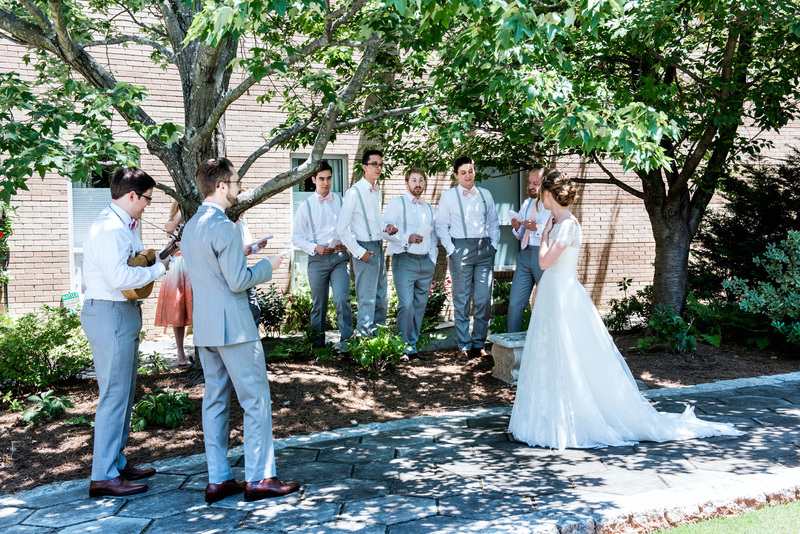 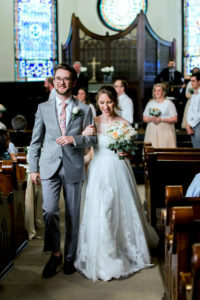 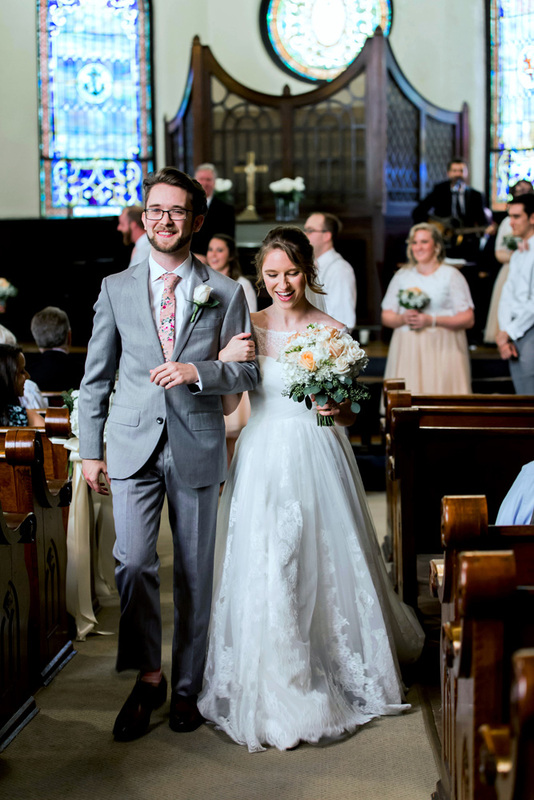 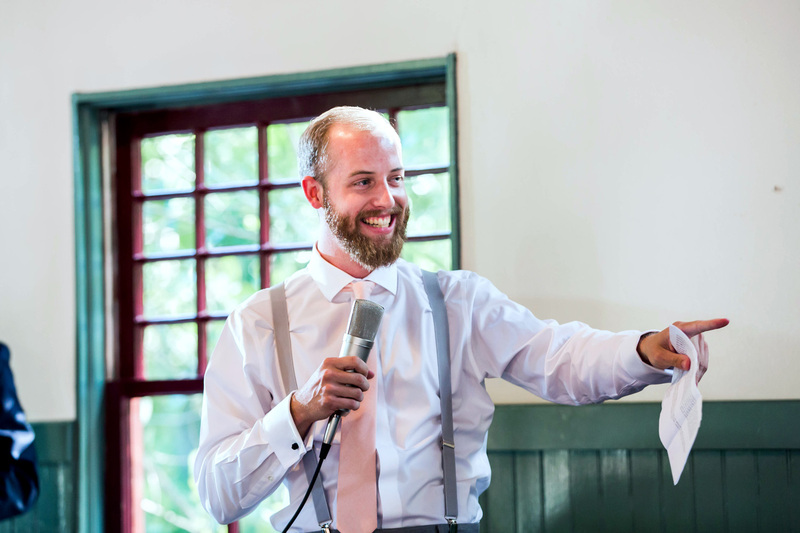 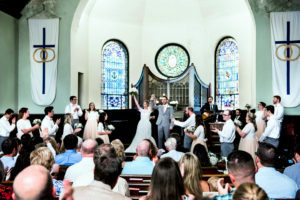 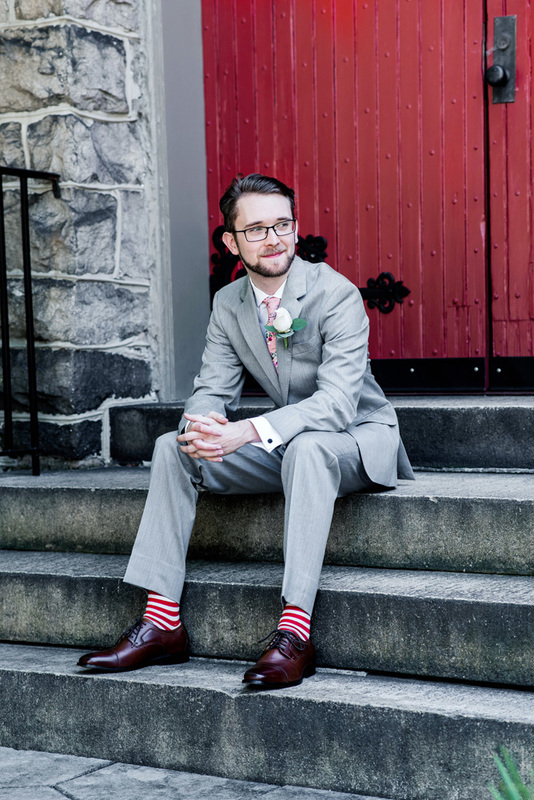 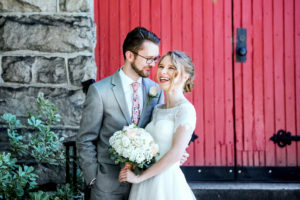 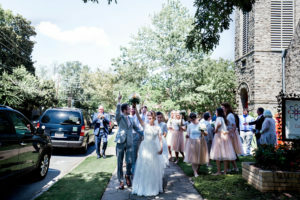 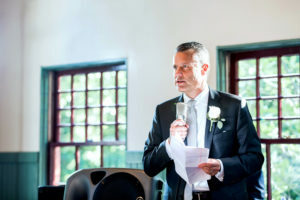 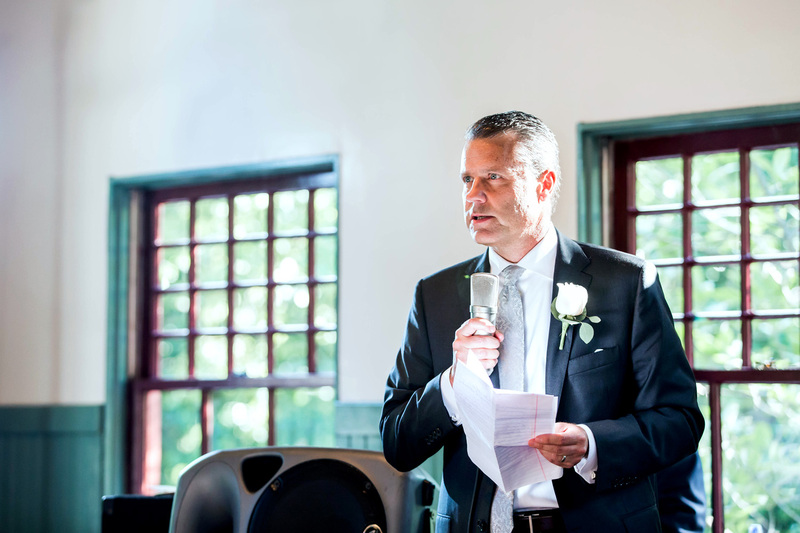 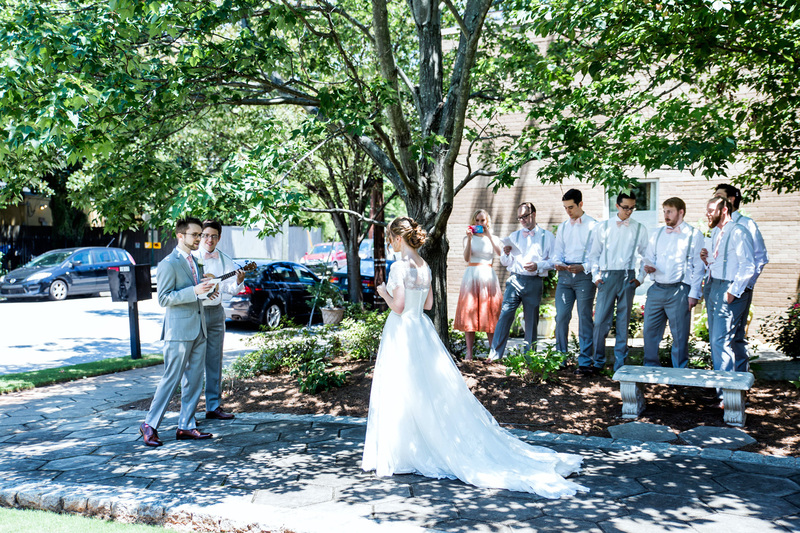 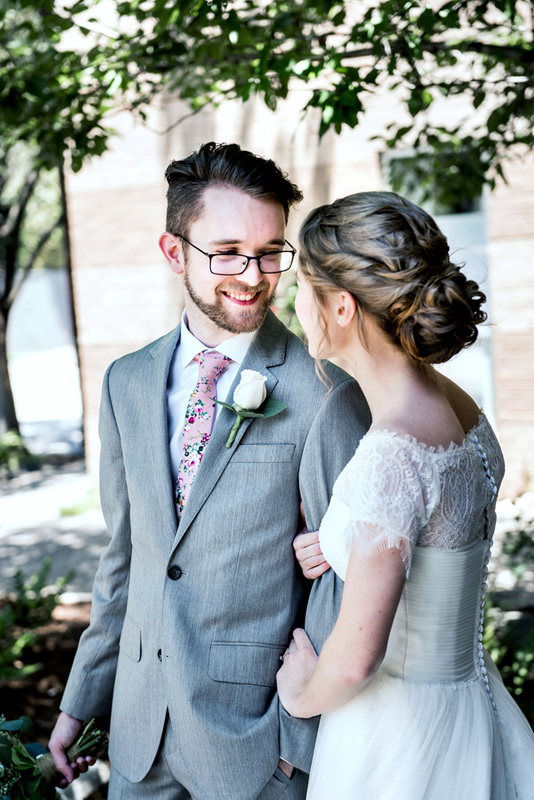 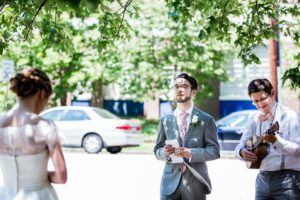 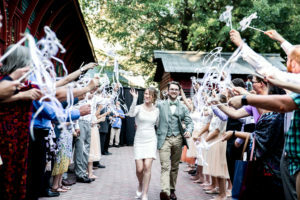 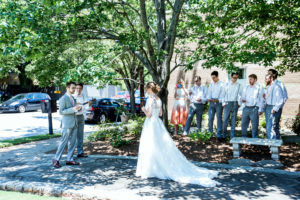 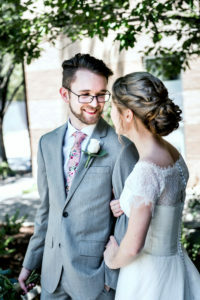 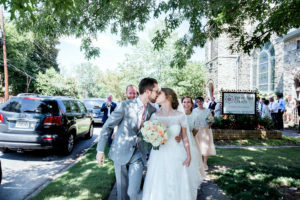 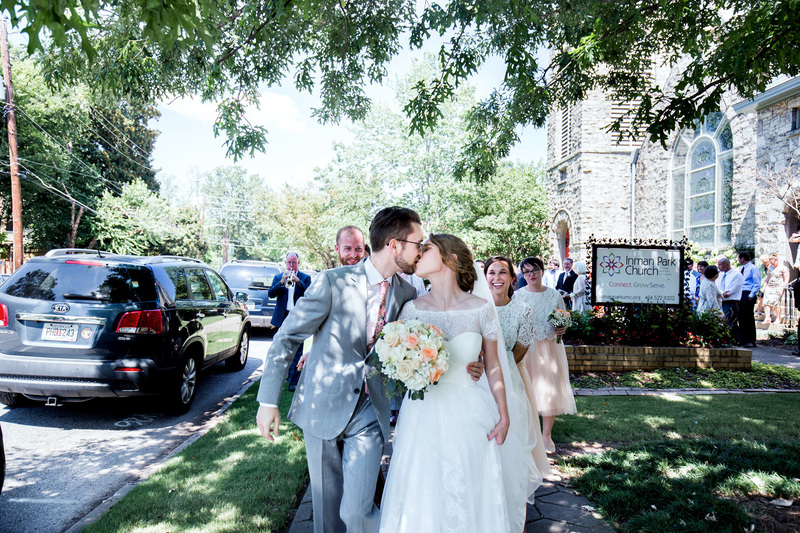 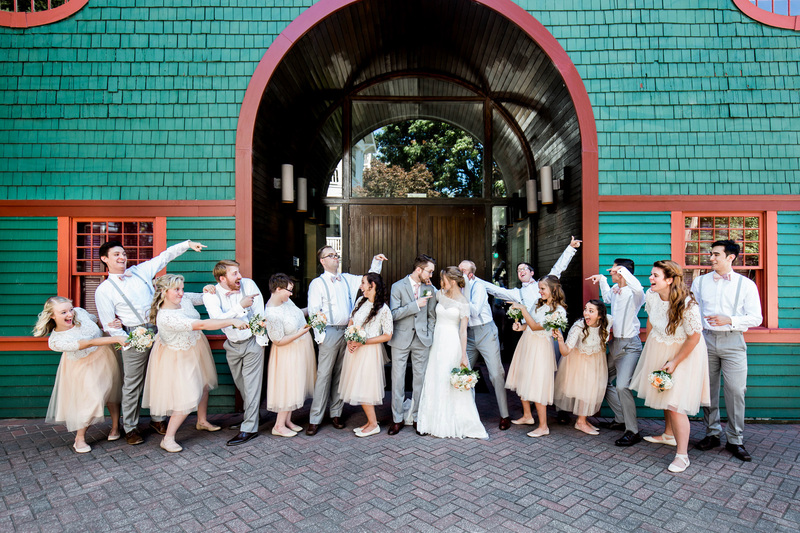 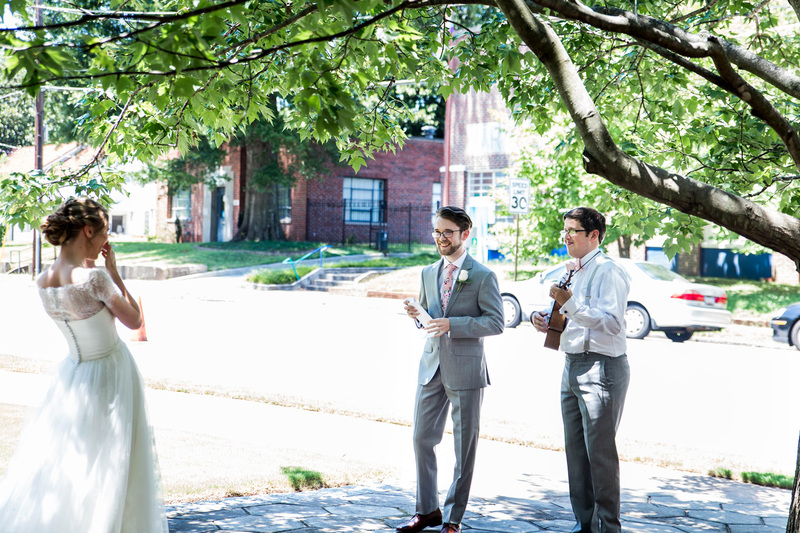 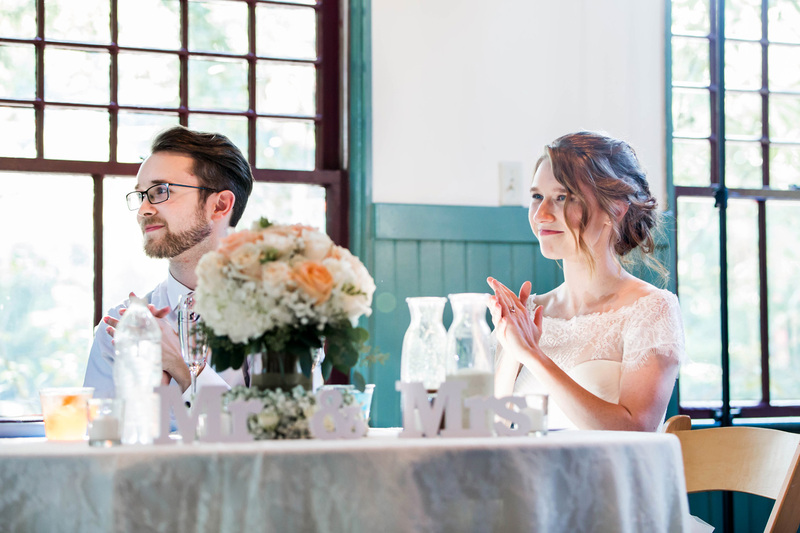 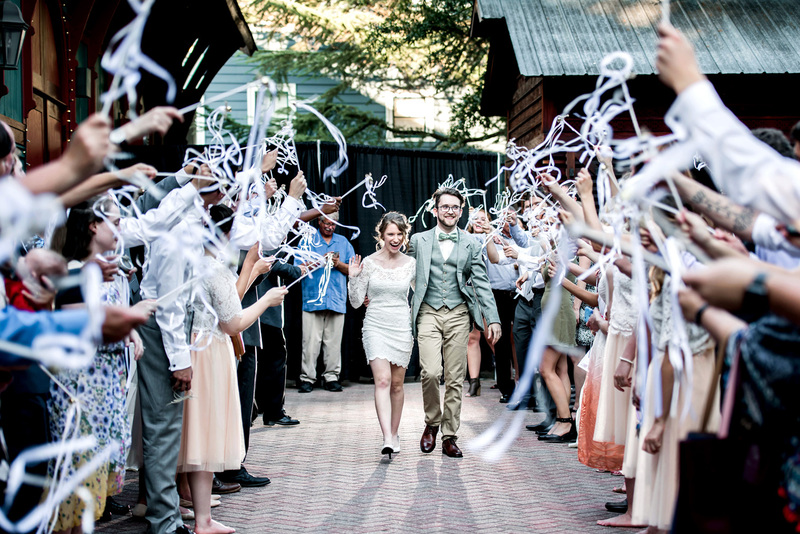 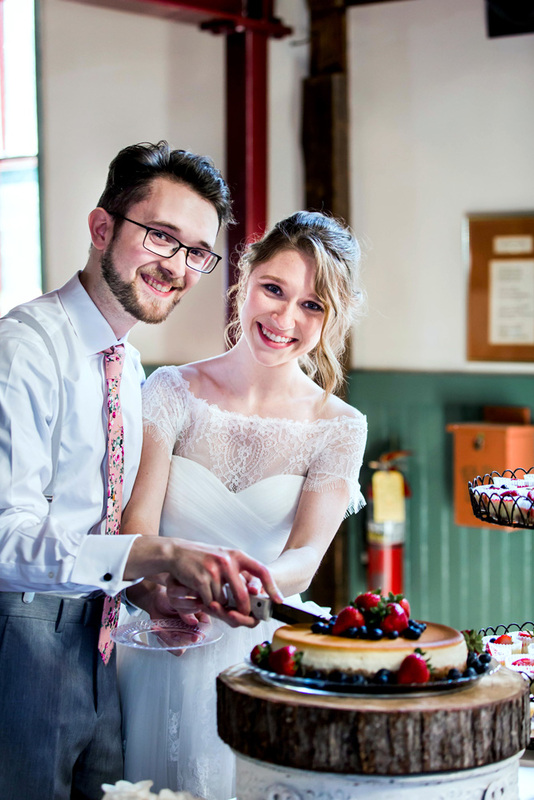 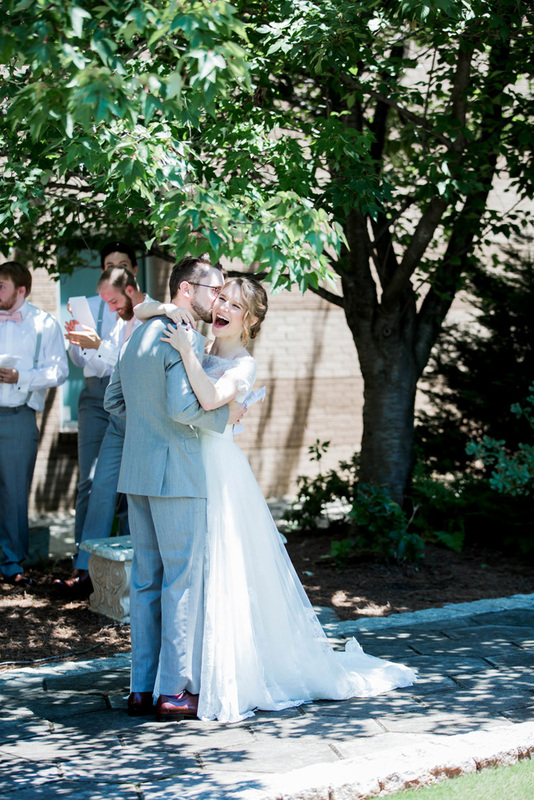 Since the Trolley Barn was within walking distance from the church, after the ceremony, Jonathan had arranged someone to play the trumpet and the entire group marched from the church to Trolley barn together! 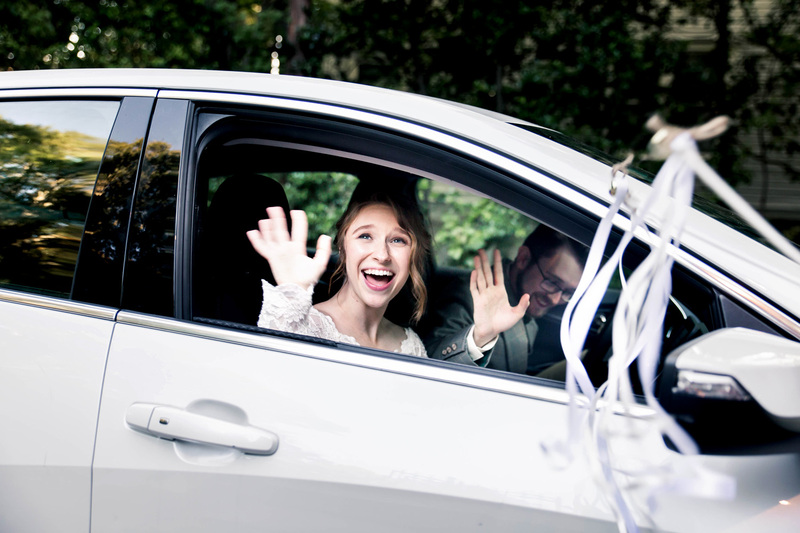 Cars drove-by and honking to congratulate them and it was just a JOYFUL celebration all the way!